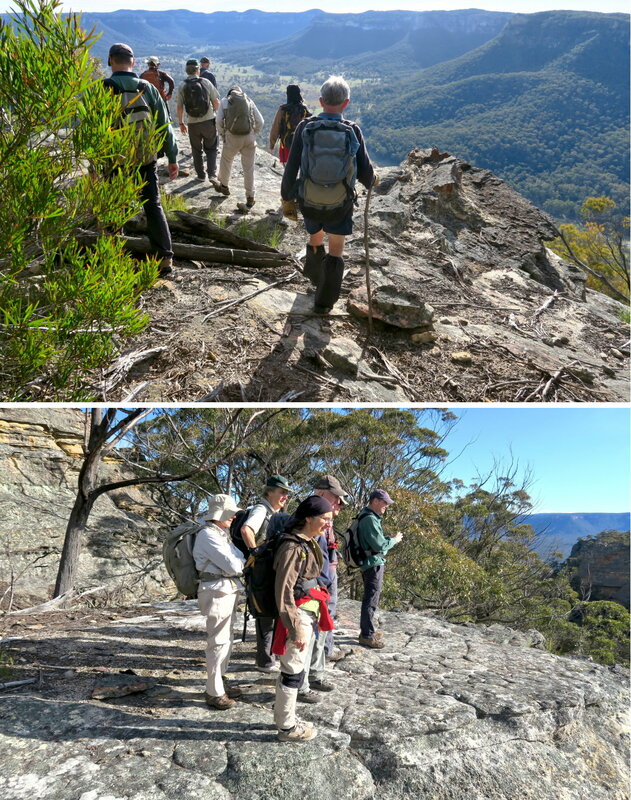 Most seasoned Sydney/Blue Mountains bushwalkers have been up at Donkey Mountain a few times already. And Geoff Fox, the king of Donkey Mountain, has been up here more than 50 times!!! But I'm catching up ... this is my 3rd time. - Bermuda Triangle ... It took Geoff a few years to figure out how to reach it. So what hope is there for a mortal soul like me to find my way there ! - Kents Crevasse ... In the 2nd trip, I reached its entrance. But I didn't venture in ... didn't know there were goodies inside! If you want to climb a mountain, and spend the rest of the time in a fairyland for big kids, hopping between pagodas, sometimes over deep fissures; or walking through canyons; or just sitting around and marvel at the view of the valleys below, then there is no other mountain than Donkey Mountain. From the map, it looks as if one can traverse the top of the mountain in no time, as the distance is only about 1 km. But that 1 km is pack full of intricate topography ... pagodas, canyons, fissures, narrow passages, caves, chambers, ..., that you really need to spend a few days to fully explore the place, and appreciate the wonders of Donkey Mountain. In the following trip report, "sketch map" refers to the North-East Maze sketch map ... unless specified otherwise. 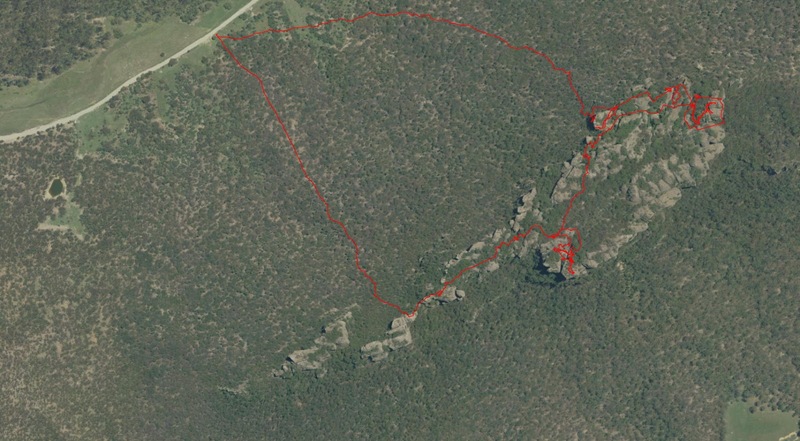 Here is our tracklog, red colour, clockwise circuit, superimposed on the 1:25,000 map. 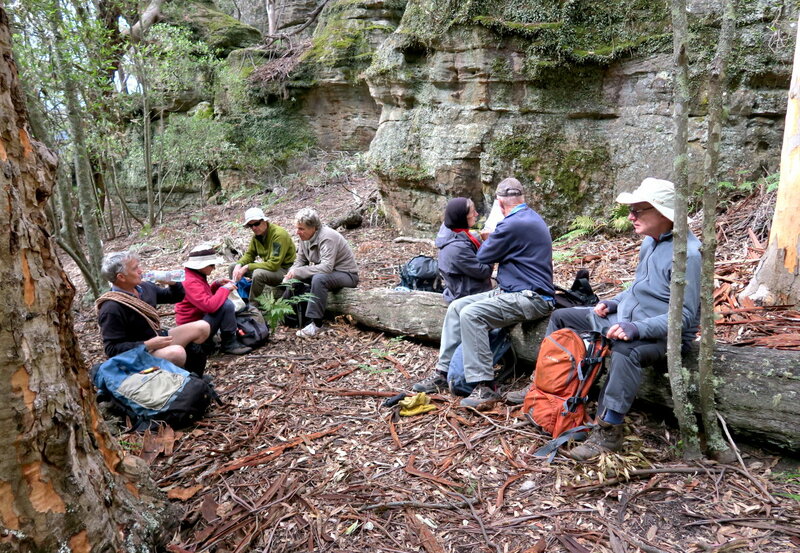 Starting point of the walk is from a small carpark by the side of Wolgan Road. Lunch. 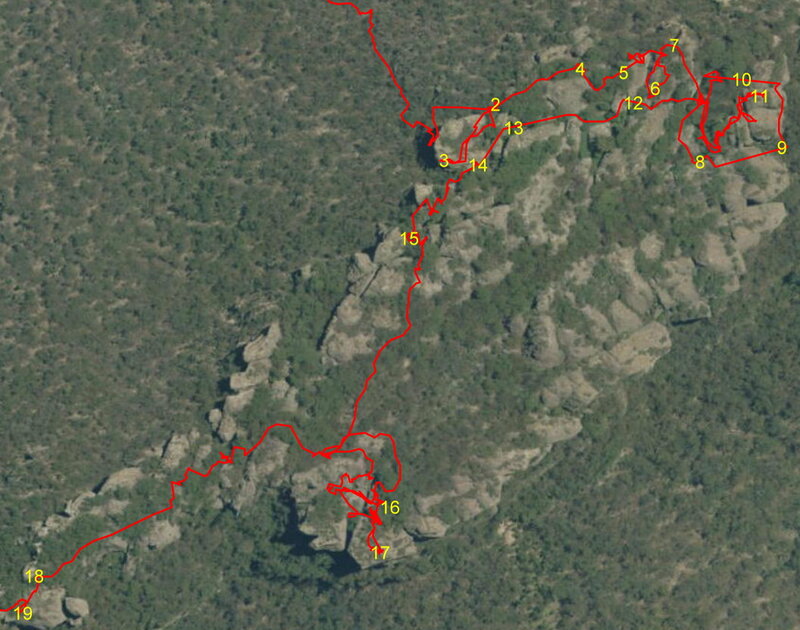 Next 2 hours of tracklog belongs to BB because my GPS is not turned on. 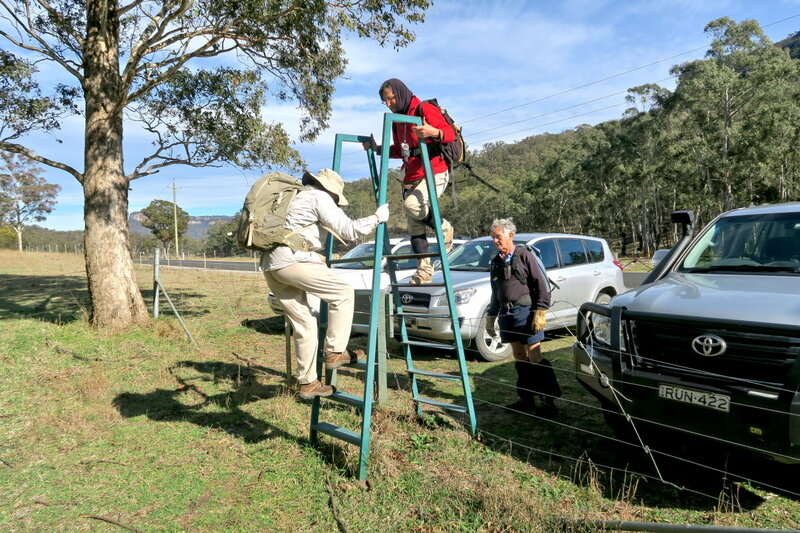 1) Stile from Wolgan Road into Donkey Mountain National Park ... this is where we park our cars. Donkey Mountain is in front. There is no prominent peak in this mountain. 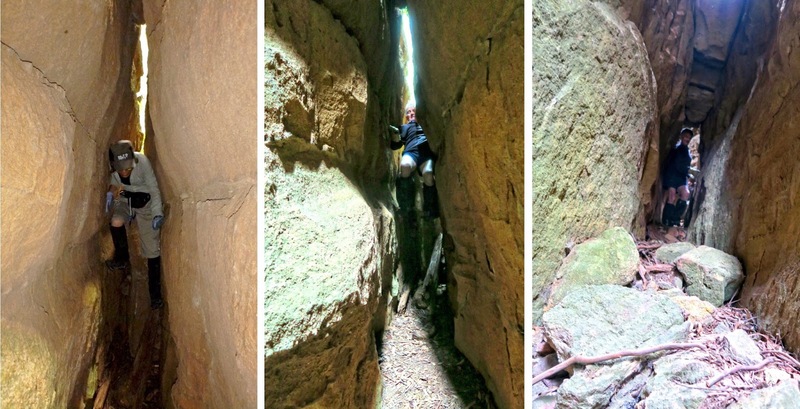 Instead, there is a maze of pagoda-like rock formations and narrow passages at the top. 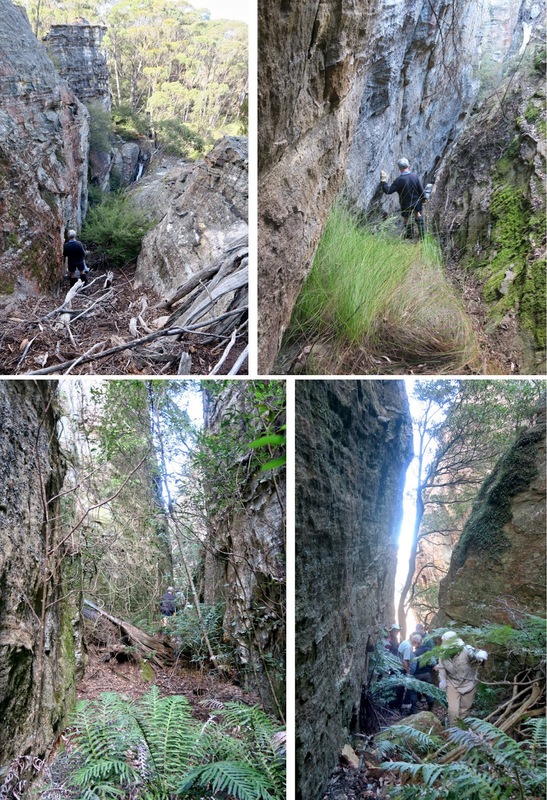 The 3 photos below are of the same area, Geoff Fox is leading; followed by BL, AOB, RS, SZ. 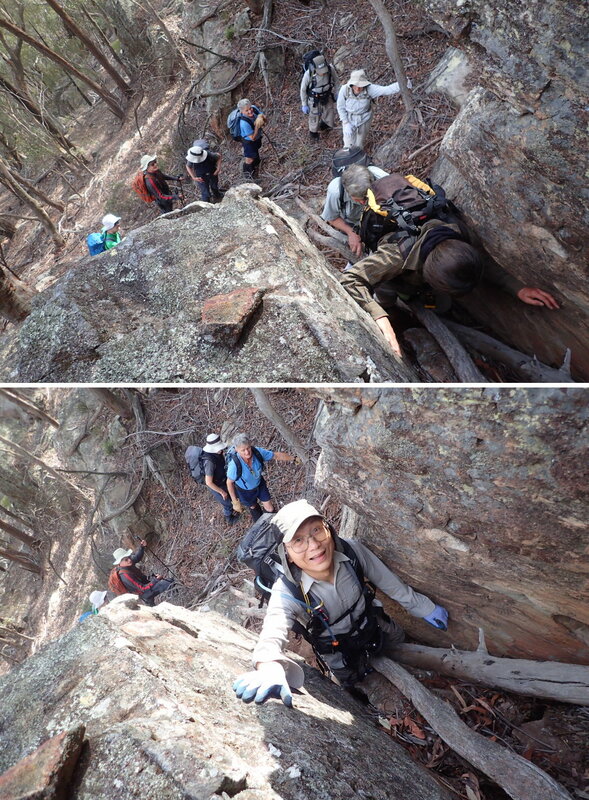 In the 2 photos below, AOB is leading; followed by RS, SZ; then me; then JD, YL, JP, BB. All 10 of us are accounted for in this and the previous 3 pics. 5) We've arrived at Donkey Mountain. 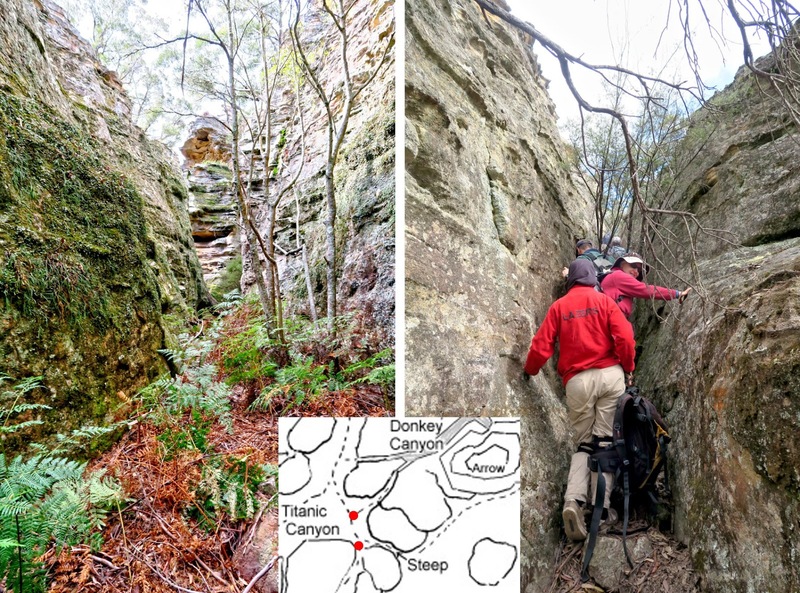 • Red arrow points to an unnamed hill just west of Donkey Mountain. 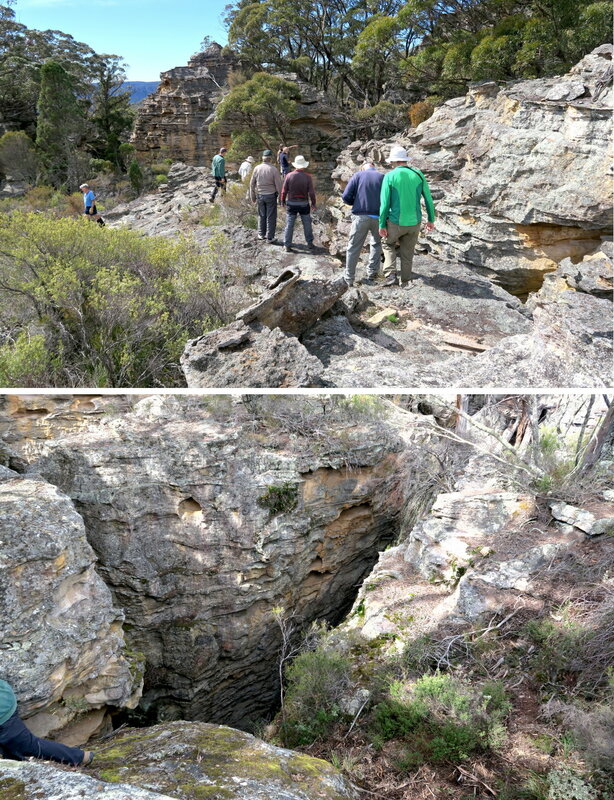 6) The hole in the middle of the pic is the entrance to Kents Crevasse. 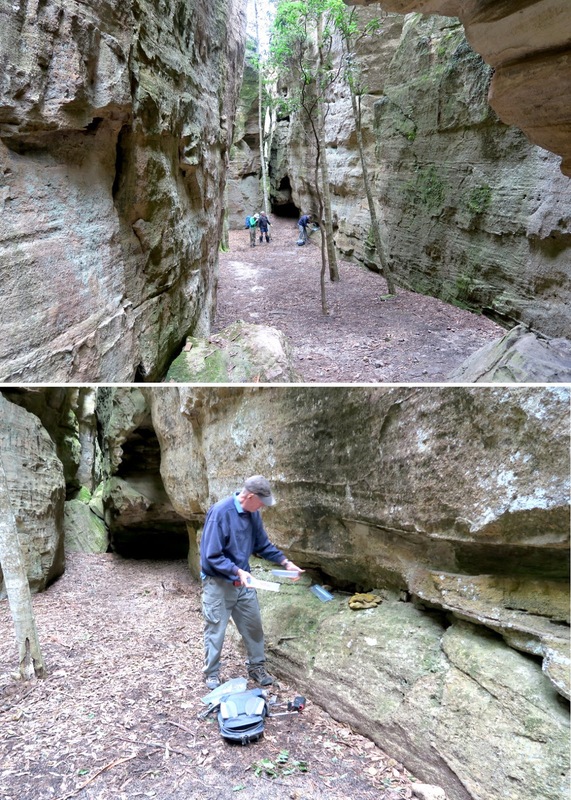 The story goes that years ago, Geoff Fox and Kent were exploring around here and came upon this hole. It is like a chimney inside. Kent volunteered to go in and climbed up to the top. He came back down and reported that nothing particular interesting up there !!! 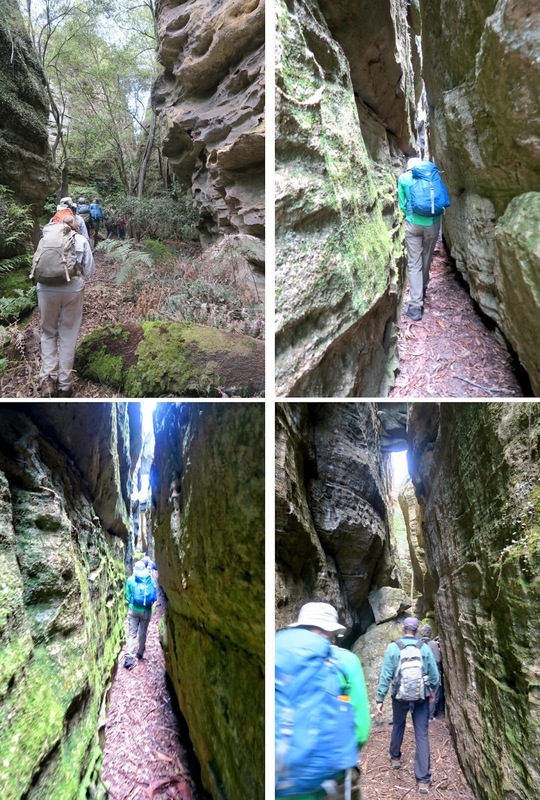 Anyway, Geoff named this passage "Kents Crevasse". 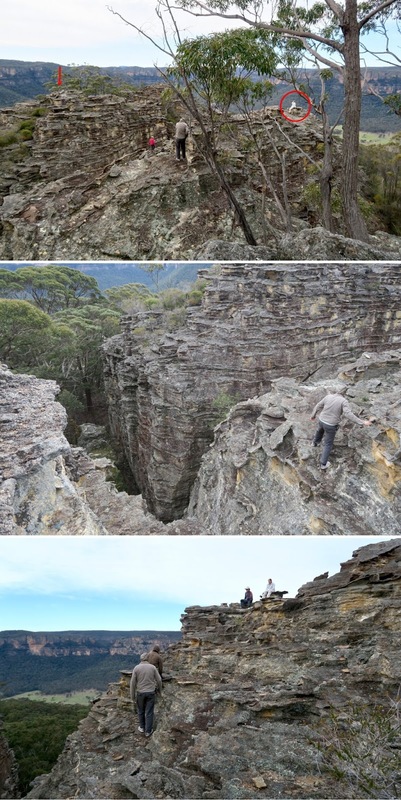 Below are a set of photos and you can judge for yourself whether it is worthwhile to climb up. 5 months ago, in my 2016-03 trip, we came to this hole but we didn't go in. Well, we didn't know what was inside. Photo #31 is a photograph of this same hole. Geoff Fox is leading, followed by SZ, then AOB, BL, YL. I am at the rear in the lower right photo (photograph courtesy of BB). 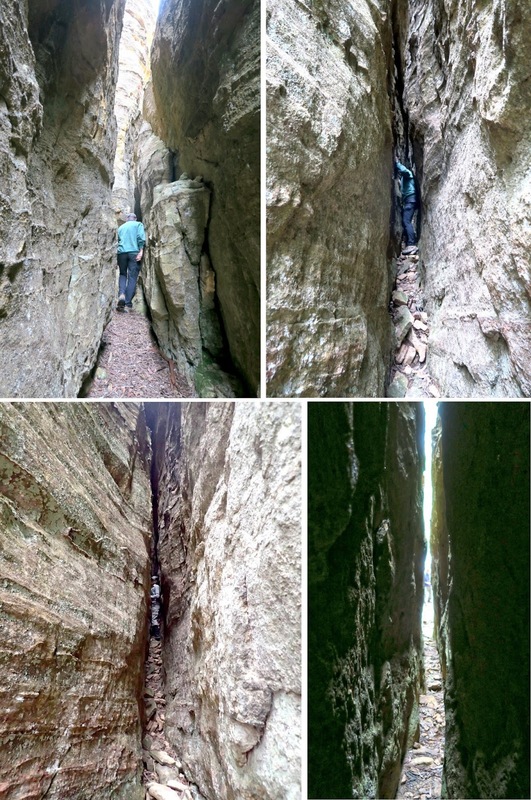 8) It is a vertical hole inside Kents Crevasse, like a chimney. - Lower pic, left to right: YL, BL, SZ, AOB's foot (photograph courtesy of RS). 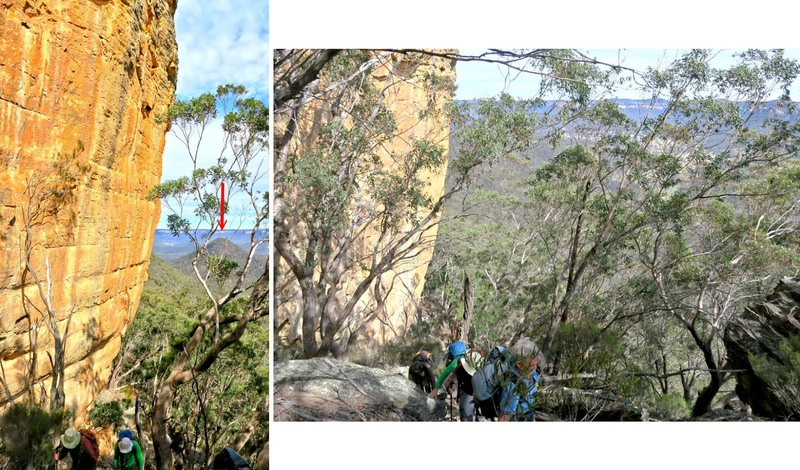 9) Straight after getting out of the chimney is this near vertical rock face to climb up (the yellow arrow). Fortunately there is a dead tree trunk to assist us. 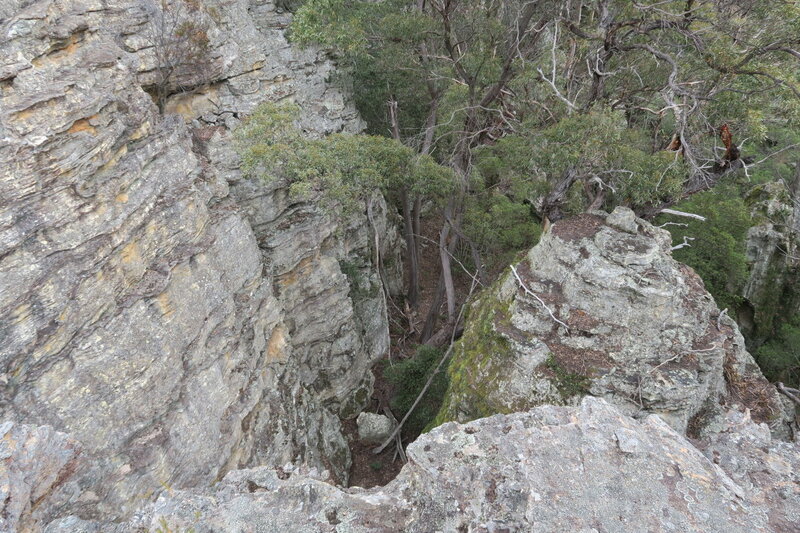 10) Then it is going towards a nearby lookout. (Photographs courtesy of BB & Geoff Fox). 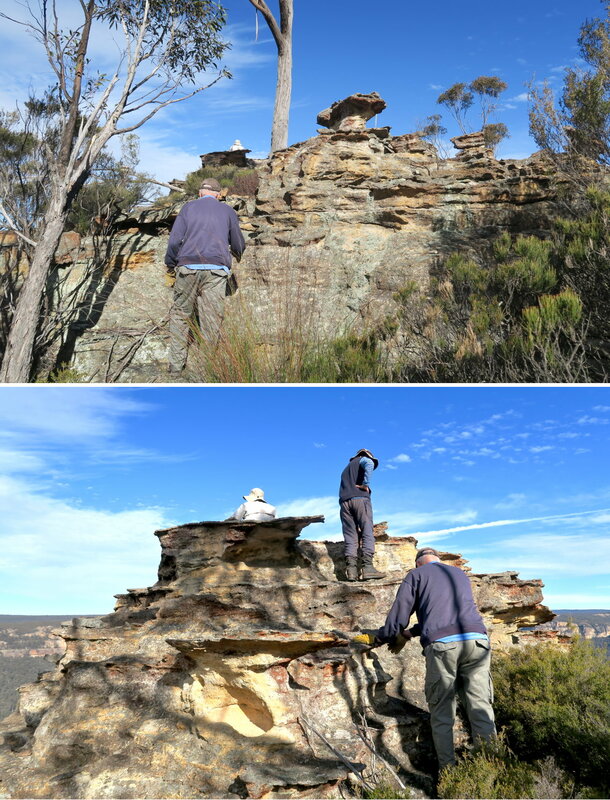 In the 3rd pic below, I am on top of the lookout. It is definitely worthwhile to climb up here. 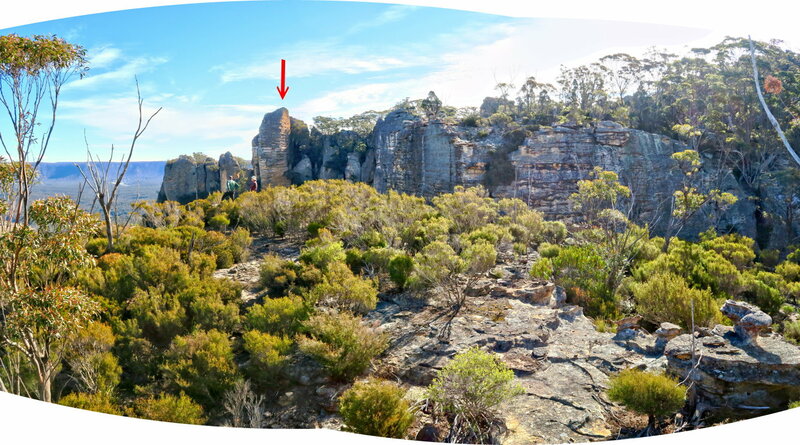 • The cliffs to the left of the left-most red arrow is part of Donkey Mountain. • Small red circle: Carpark by the side of Wogan Road ... where our cars are parked. 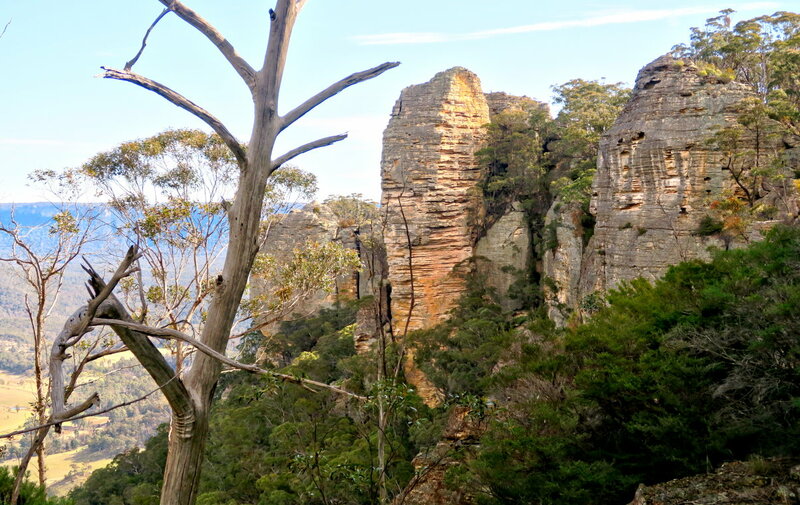 The story goes that the unnamed hill is actually Mt Wolgan. 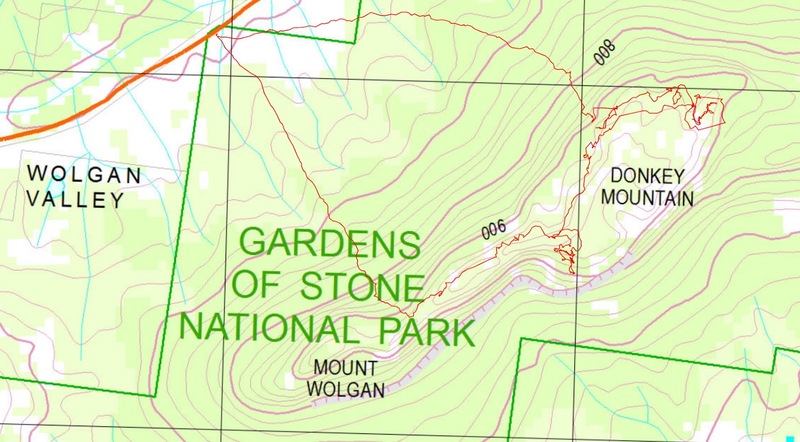 However, the cartographer placed the label "Mt Wolgan" wrongly at the west end of Donkey Mountain, hence the hill is now unnamed ... haha ! • BB is at rear. In front of him is Geoff Fox. In front of him are JP, RS. 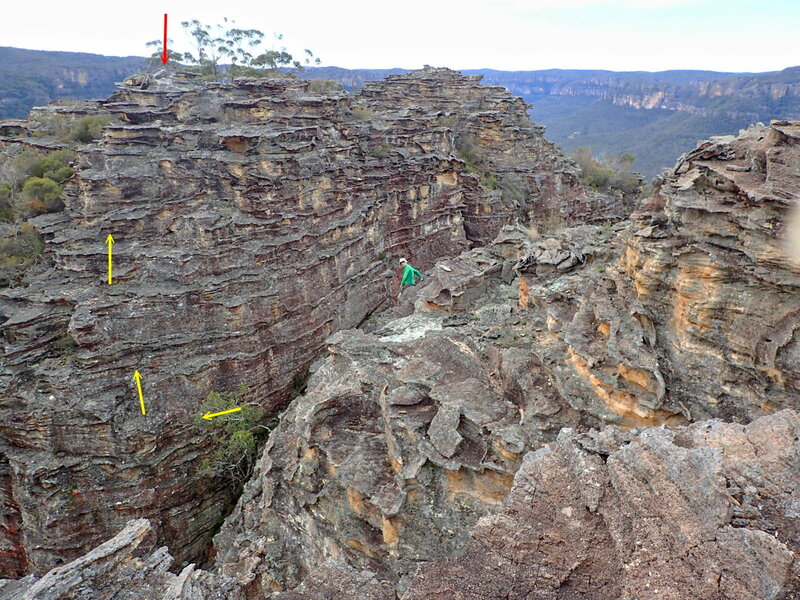 • On the far side, AOB's raised arm is pointing at a fissure, the bottom of which is Grand Hall, see photos #55 to #58. 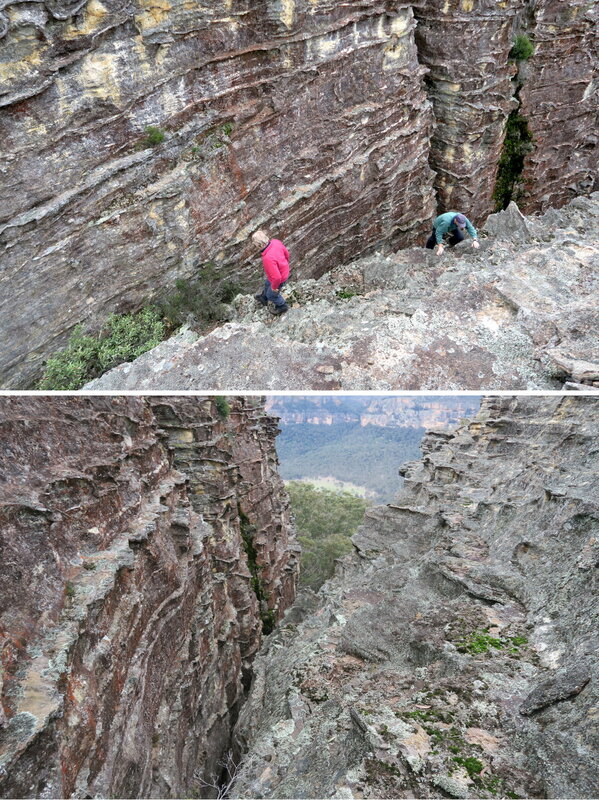 - Lower pic: This is the fissure pointed to by AOB in the upper pic. The bottom of it is Grand Hall. 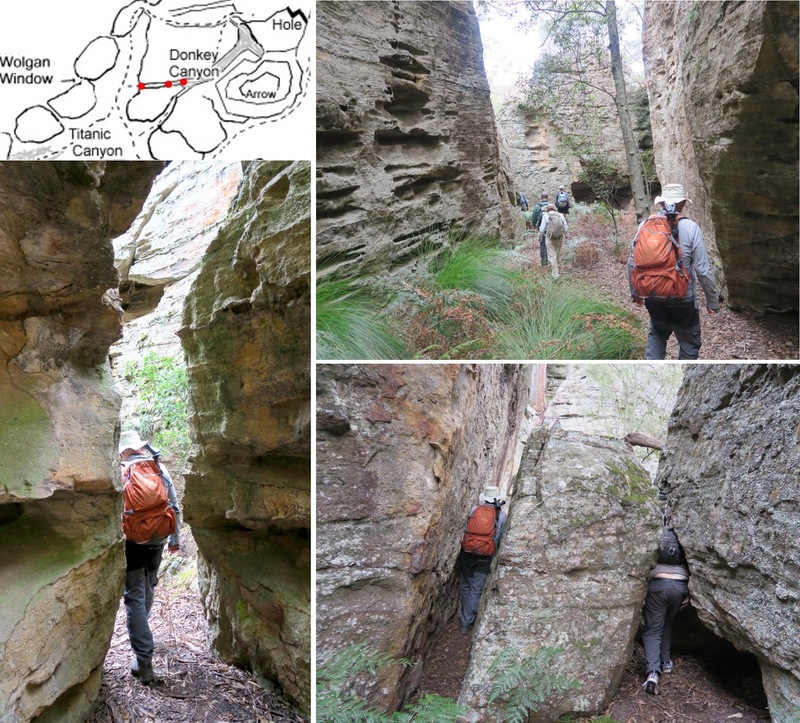 "Freeway" is labelled in Geoff Fox's sketch map as the route between Kents Crevasse and this interesting rock formation. 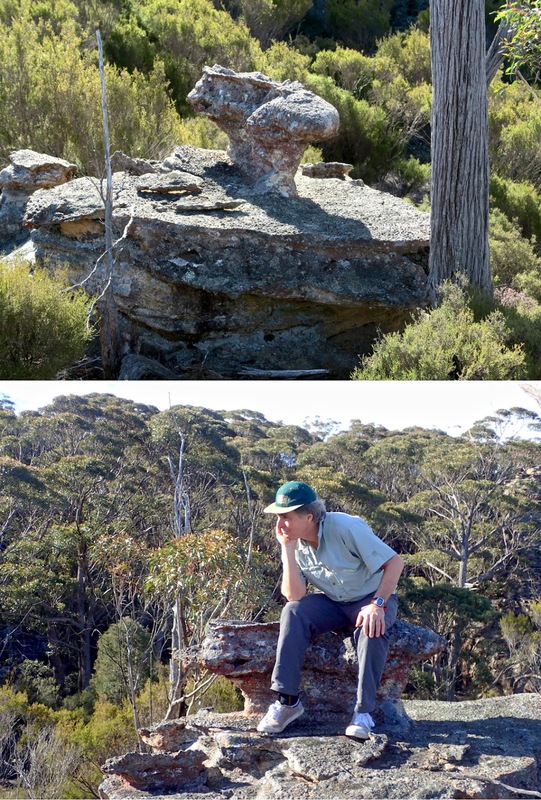 13) Most probably Geoff Fox has given a name to this rock, but it is not labelled in his sketch map. 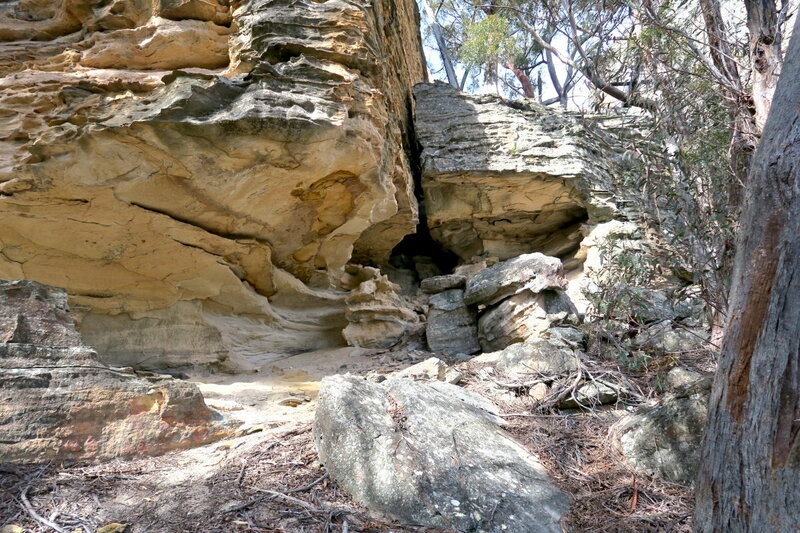 I wonder whether this rock is climbable ... if not to the top, then to that interesting gap near the top ??? 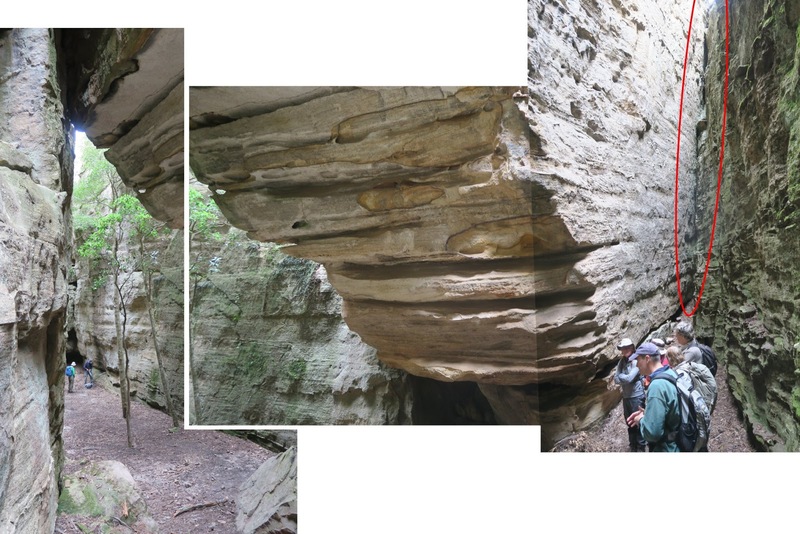 14) Next, we pass by this rock in an area labelled in Geoff Fox's sketch map as "Mossy Rocks"
15) After Mossy Rocks, we come to Little Canyon. It is in Geoff Fox's sketch map. 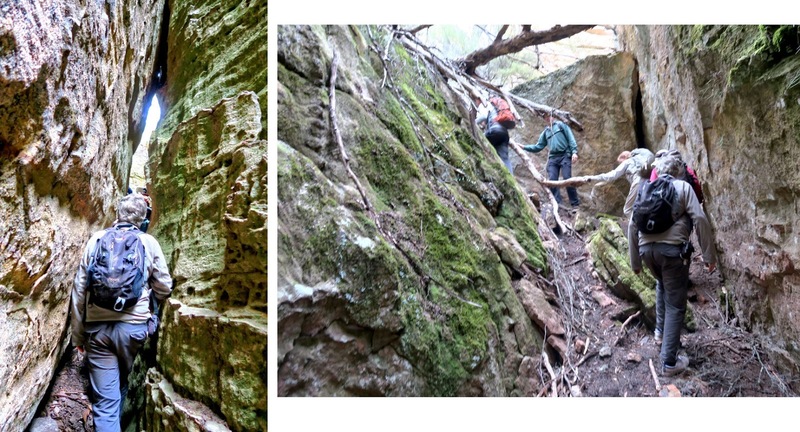 - Left pic: At the entrance of Little Canyon. Geoff Fox is leading, followed by AOB, then BL, SZ. 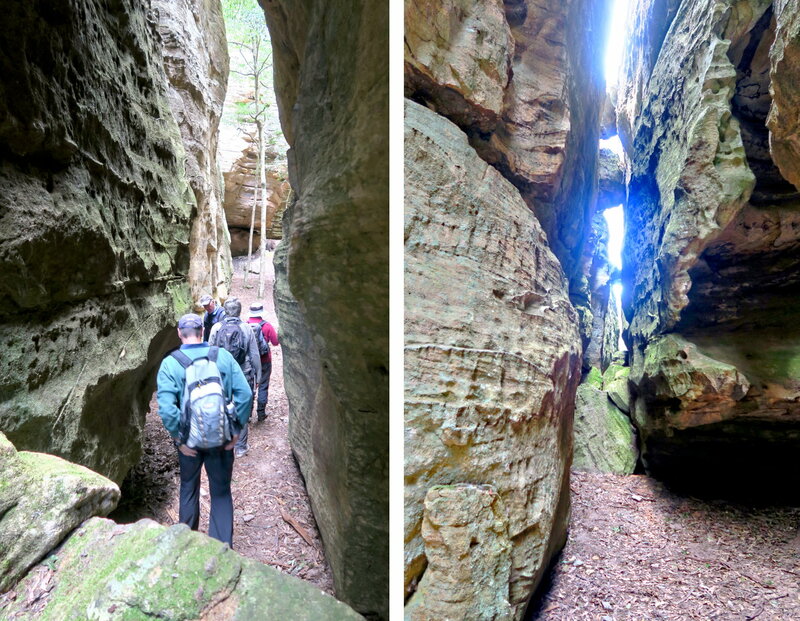 - Right pic: Inside Little Canyon. SZ is leading, followed by YL and JP. After we are out of Little Canyon, RS discovers he is missing his backpack ... he absentmindedly left it at the entrance to Kents Crevasse ... haha ! While he went to retrieve his backpack, the rest of us have a rest ... well, it is morning tea time. 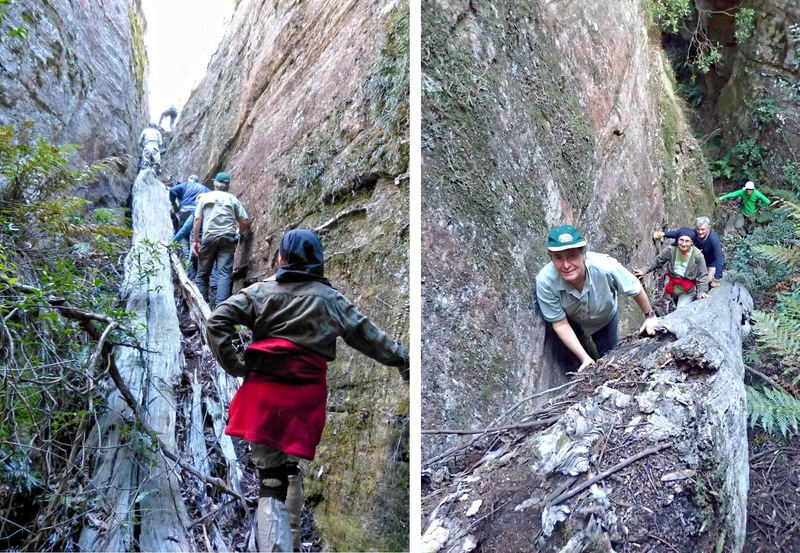 16) After morning tea, we leave our backpacks behind and climb up this narrow fissure between the rocks to Eagle Nest. - Left pic: AOB is leading, followed by SZ and BL. 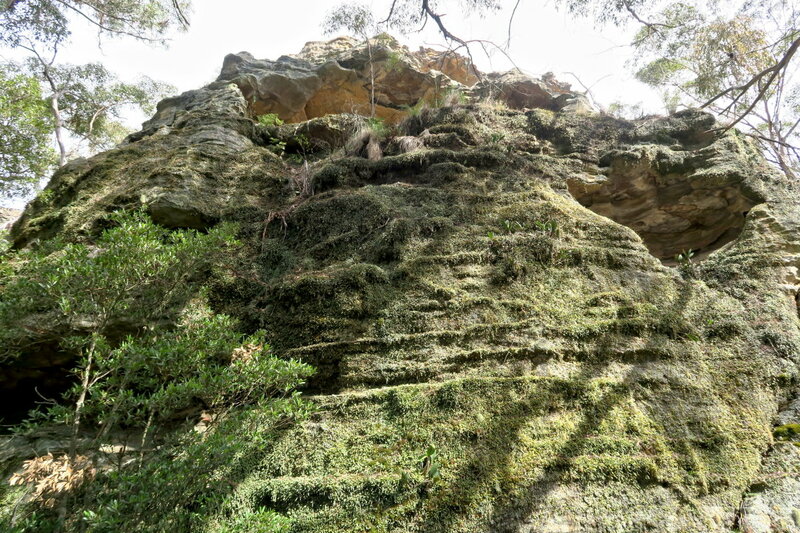 - Right pic: I've climbed to the top of the rock and looking down at JP climbing up. 17) At the top of the rock we have our first glimpse of Bermuda Triangle, the triangle at the middle of these two pics. We'll be going there later on. 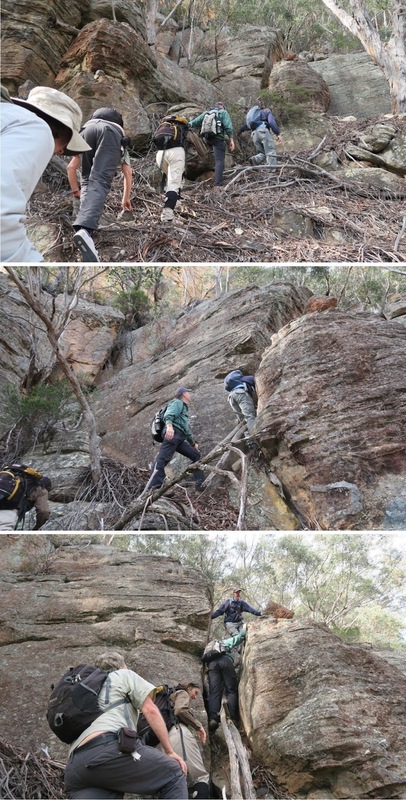 - Upper pic: JD is leading, followed by SZ, then Geoff Fox, BL, YL. We return to retrieve our backpacks. 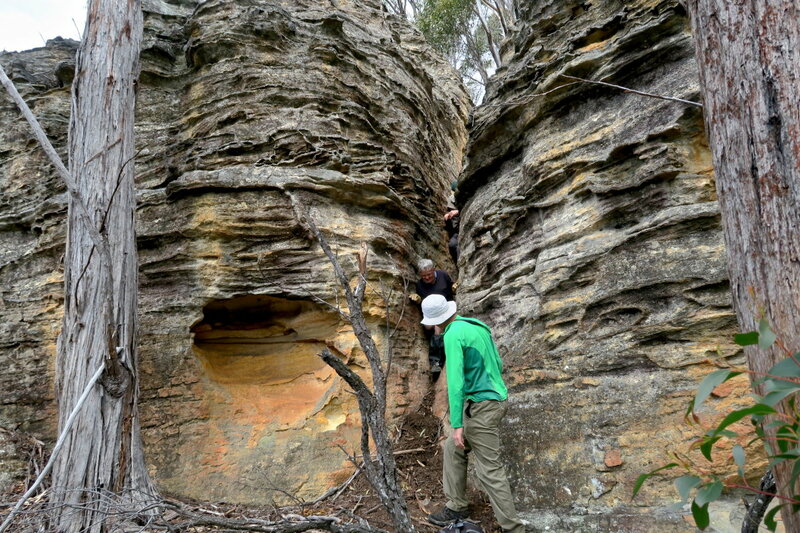 19) This is the same fissure as in photo #16. It is also where we left our backpack. 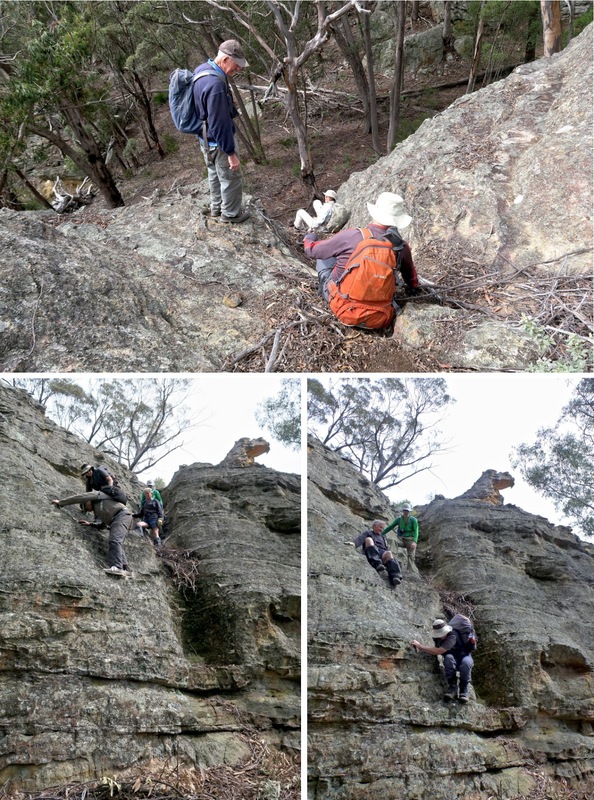 - Upper pic: Geoff Fox is watching SZ and JP (orange backpack) going down. 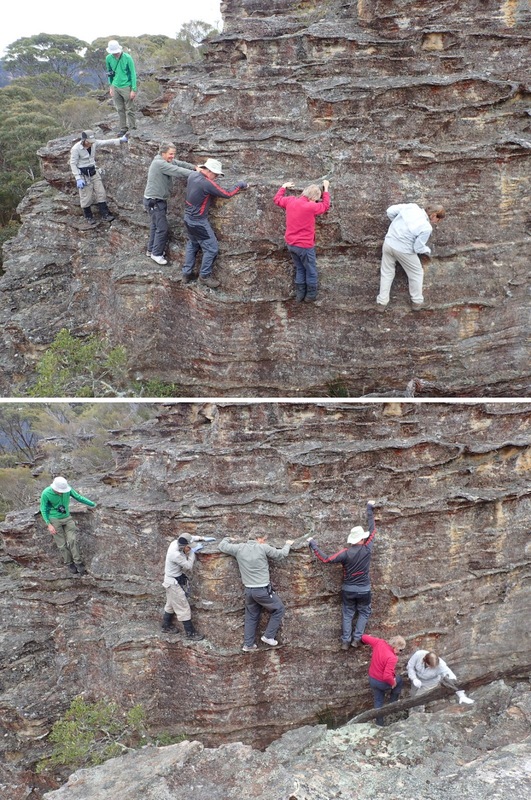 - Lower pics: I have climbed down and now watching BB (far back), JD, YL, RS (lower left pic only) inching their way down. 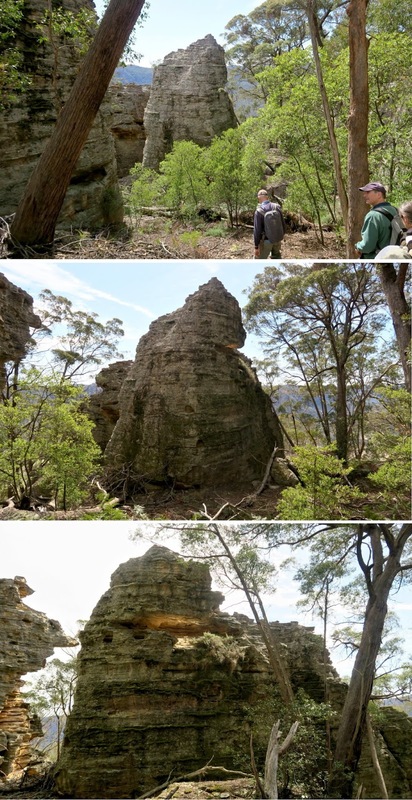 Eagle Rock is the interesting rock that looks like a open mouth of an eagle. - This area (see also photo #30) is near the western entrance of a very narrow slot called Jenny Craig ... we'll enter Jenny Craig from its eastern entrance, and exit near here, the western entrance. which was my 2016-03 trip to Donkey Mountain. In the above mentioned 2016-03 trip, I have been to Green Room too, as well as the next 2 destinations Green Room Portal and Jenny Craig. Green Room pictures are in photos in #12 to #16 in the above link. 22) Left pic: Entry into Green Room is through this narrow slot. Right pic: I am inside Green Room now and looking back at the narrow slot. • JD is out of the slot. Inside the slot is JP; and behind him is RS. - Left pic: I am near the entrance and looking into Green Room. 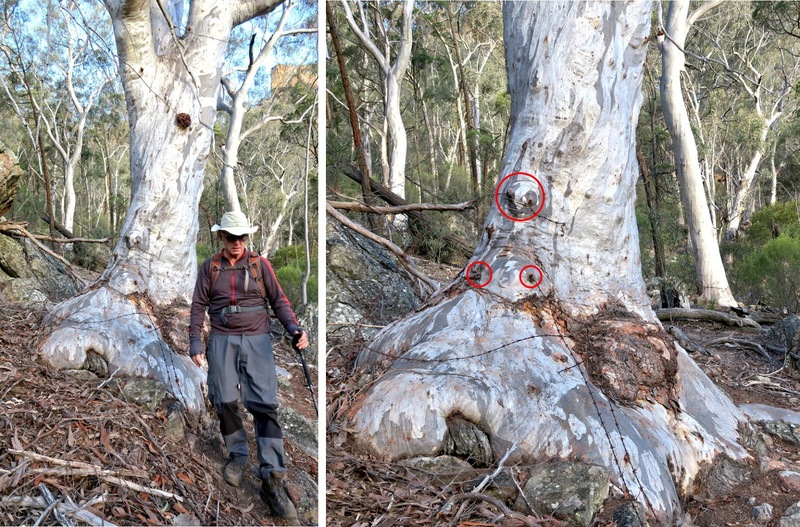 • There is a large chockstone, in the red circle. • SZ is walking toward JD. - Right pic: BL is looking at a vine which goes all the way to the top. I'm curious ... Has anyone actually climbed up to the top this way? Next, we explore the Green Room as far as where the chockstone is. I'm now wondering whether it is possible to keep going and climb out of the Green Room that way? 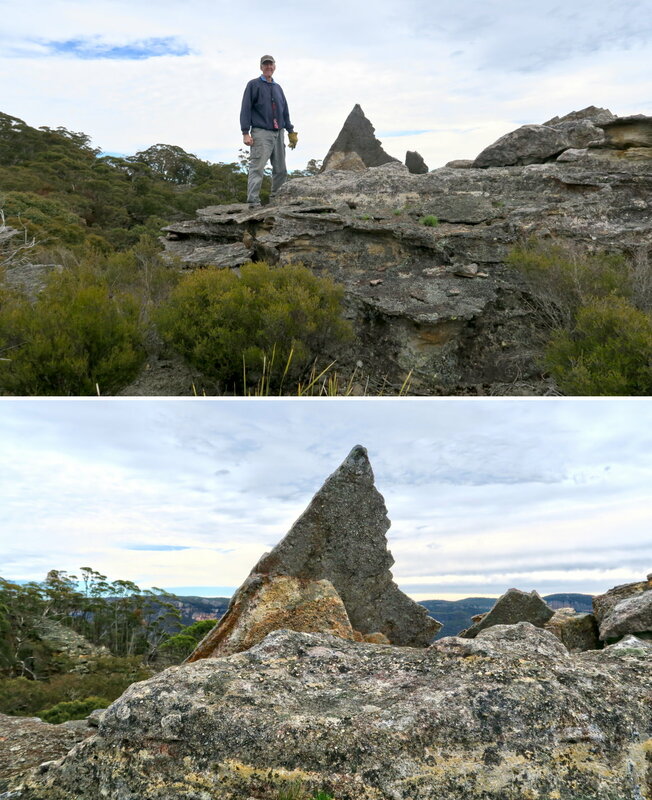 24) Left pic: I am under the chockstone of the previous pic and looking back at where we came from. • Red oval: The vine in the previous pic. • Yellow arrow: This is where we'll soon leave Green Room for Green Room Portal. • We came into the Green Room from left of the yellow arrow. Right pic: A narrow connecting slot into Green Room Portal ... the yellow arrow in the left pic is pointing at this slot. Next, we go to Green Room Portal via a connecting slot. From end to end, its length is about 75 meters. The slot is called Jenny Craig because if you haven't been through a Jenny Craig program, you won't be able to pass through it :-) ... see photo #29. 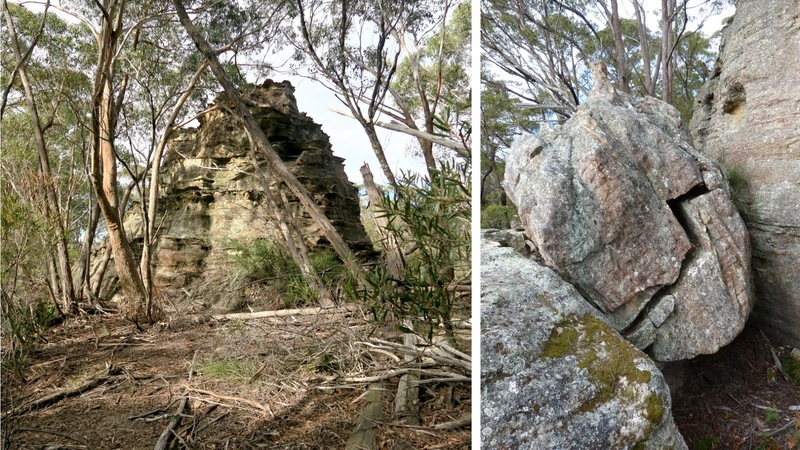 - Left pic: Shortly after entering the lot, there is a rock to climb over. 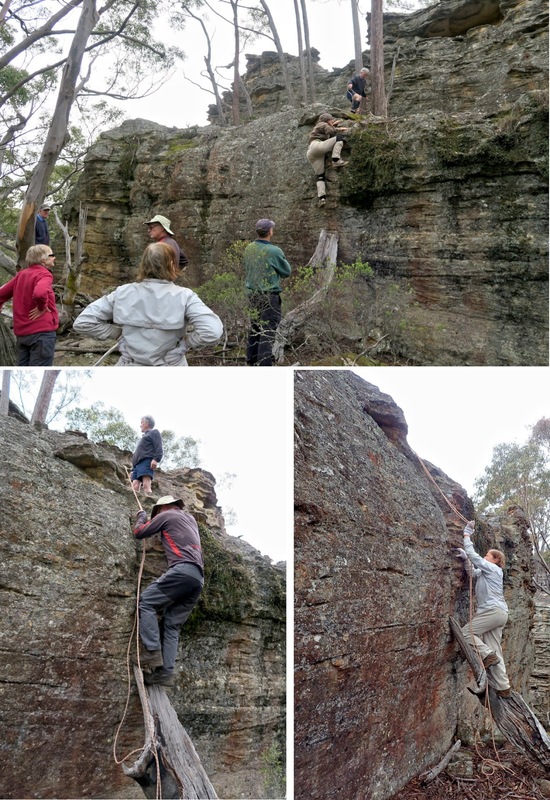 • AOB has climbed up the rock. SZ is behind her. 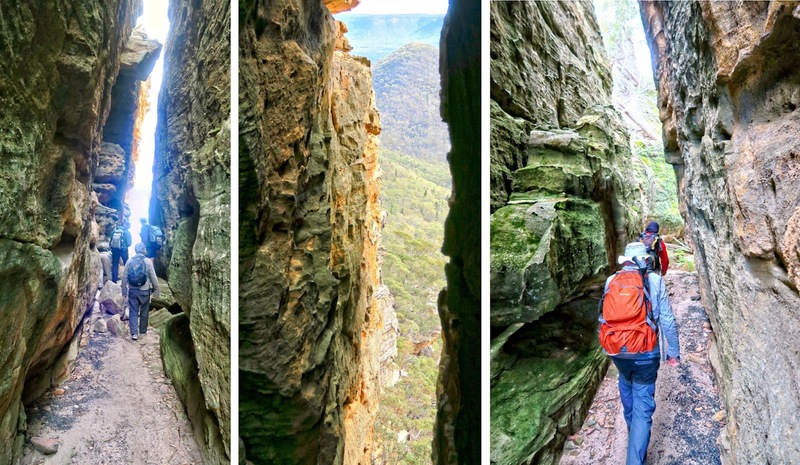 - Right pic: I have climbed up the rock of the left pic, and looking back at the entrance. • RS is climbing up. JP is behind him, followed by BB. - Upper left pic: The first half of the slot is slightly wider. BL is in front of me. - Upper right pic: The 2nd half is so narrow, you need to walk side ways like a crab. - Lower right pic: The exit ... Geoff Fox is waiting outside. 30) I'm out of Jenny Craig. This is its western entrance. - Left pic: Geoff Fox didn't go inside Jenny Craig as he has been through it many times in the past. He is waiting outside taking pictures of JP coming out. Behind JP is JD. BB is further back. Bermuda Triangle is on top of the cliff above Jenny Craig. So it is very close by. We had our first glimpse of it in photo #17. However, to get there is not straight forward. It took Geoff Fox a few years to figure out how to reach it. He is going to take us there now. 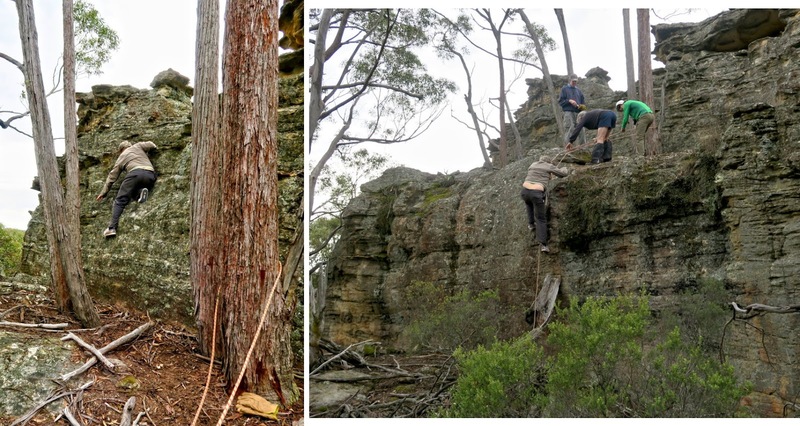 31) First, climb up here ... both pic are of the same spot. 32) The next climb is here. This one is a bit scary ... the moss makes the rock face slippery. One slip and you'll be a looong way down ! 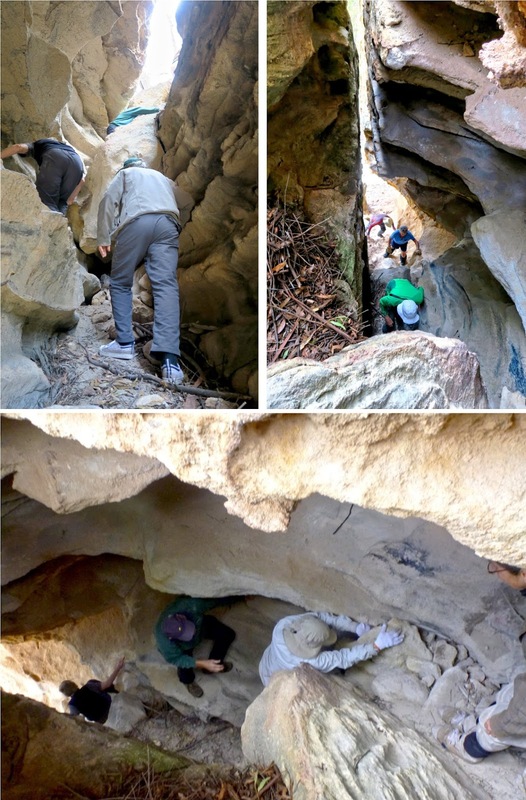 - Lower left pic: JD uses his rope to help RS. 33) The climb here is more difficult. 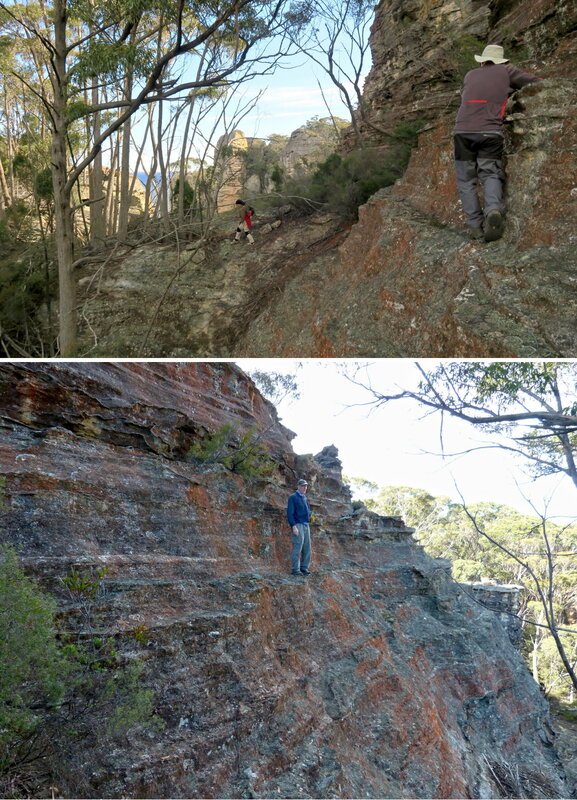 - Upper pic: JD (already climbed up) and AOB are agile enough to climb up without any assistance. 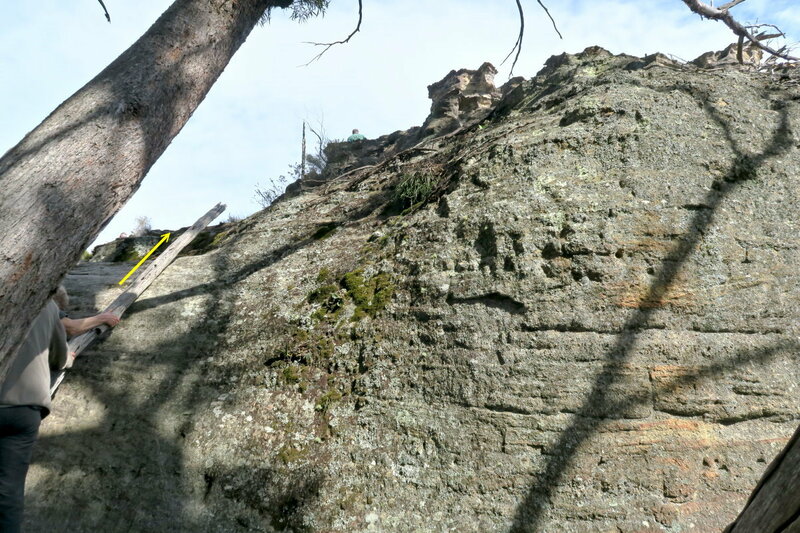 34) Immediately after the climb (previous pics) is this minor vertical rock cliff. 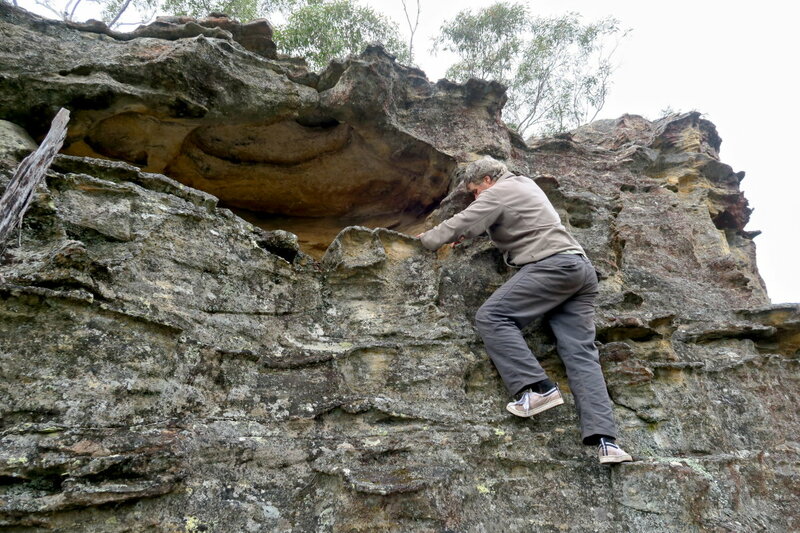 This one is much easier as there are plenty of hand and foot holds as illustrated by RS. Once we've climb over the rock cliff of the previous pic, we are at the top. 36) In the 3 photos below we are going to where SZ is sitting ... in the red circle. - The red arrow points to Bermuda Triangle. - RS is the guy in front of me. 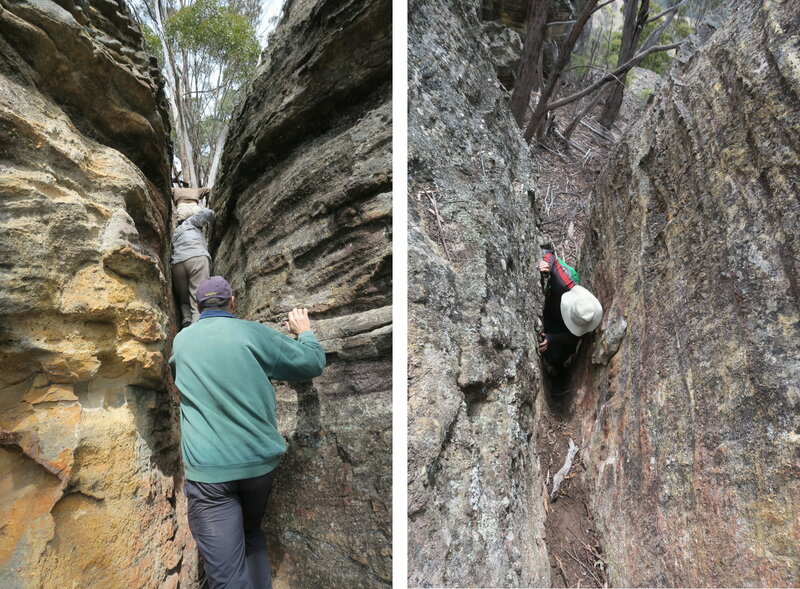 37) YL (left), BL (right) and I taking a look at the deep fissure between the rocks ... this fissure is to the left of the previous pic. 38) Finally we reach where SZ has been sitting and waiting for us. She is still sitting there. - Upper pic: Towards north ... we'll be going there next, to Bermuda Triangle, the small grey triangle pointed to by the red arrow. 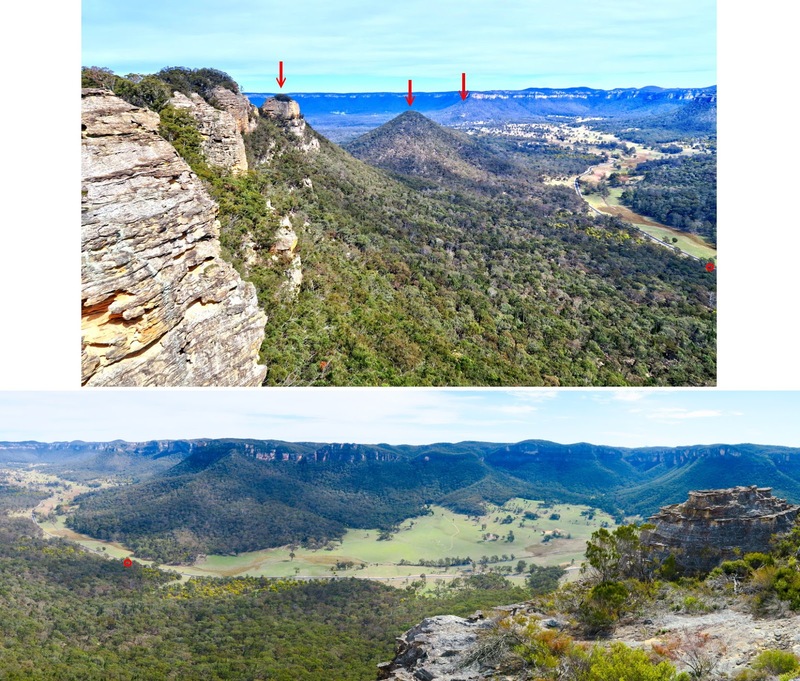 - Lower pic: Towards east ... Wolgan River flows along the green valley across the centre of the pic. 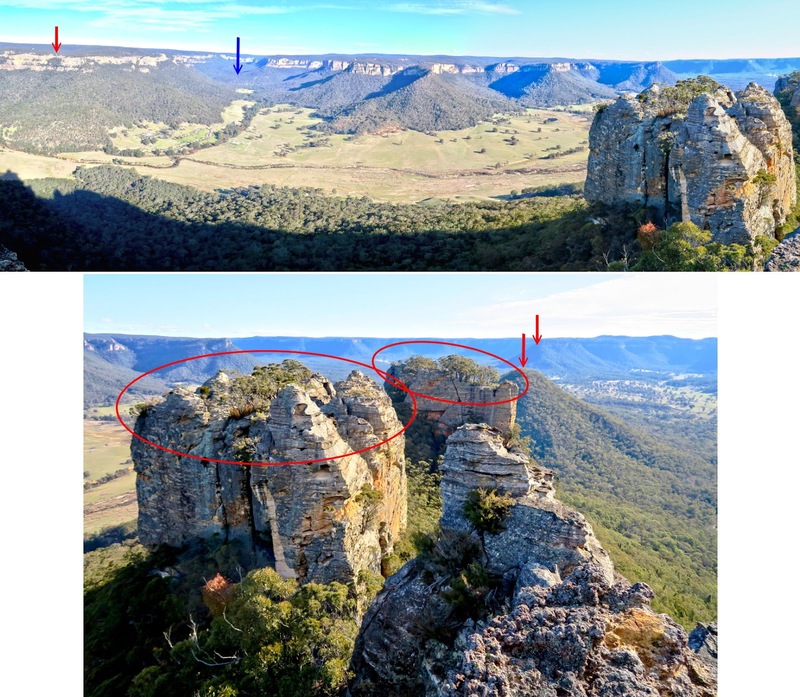 • The bunch of buildings below and between the two red arrows is Emirates One&Only Wolgan Valley Resort. We now head for Bermuda Triangle, the red arrow. - First, go to where BB is. 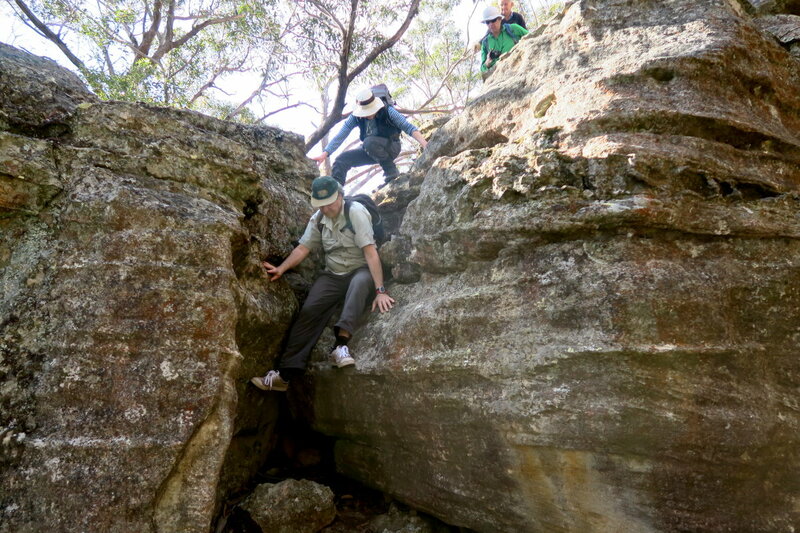 - Traverse a bit across the rock face then up !!! ... see photo #41. 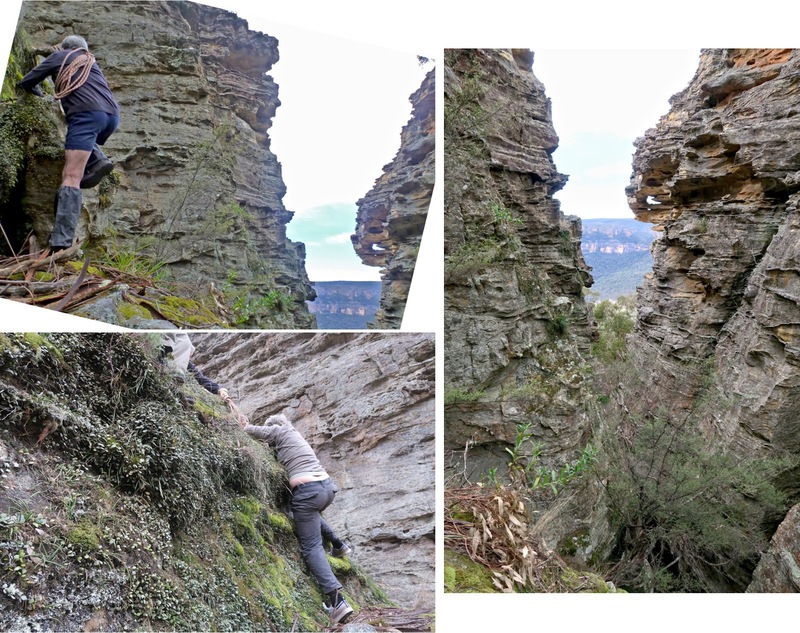 Climbing up the cliff ... the 3rd photo below shows best the vertical climb we have to do ... it is fun, but definitely not for the faint hearted. • BL is at rear. - JD in the red circle has yet to make the journey across. 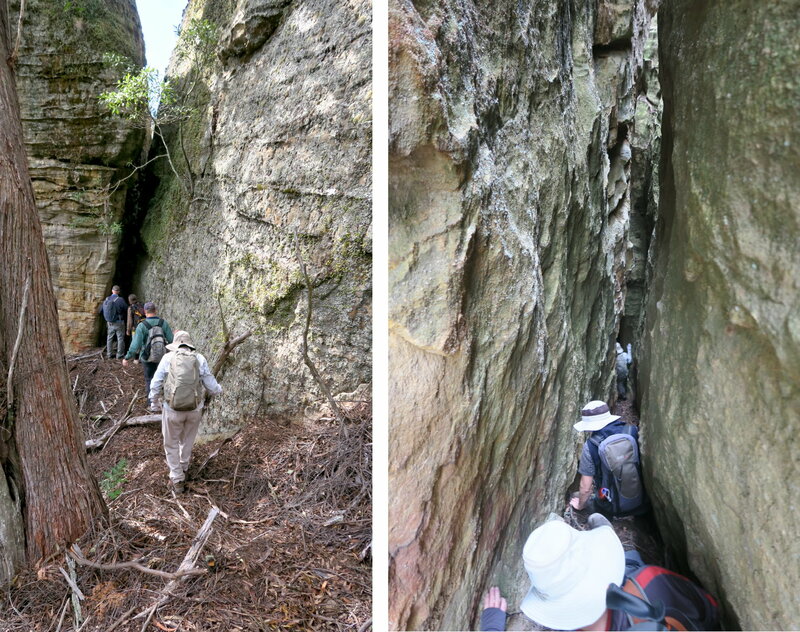 43) Next, we are going to cross this fissure. Geoff Fox calls it is Julie Craig, a side branch within Jenny Craig. 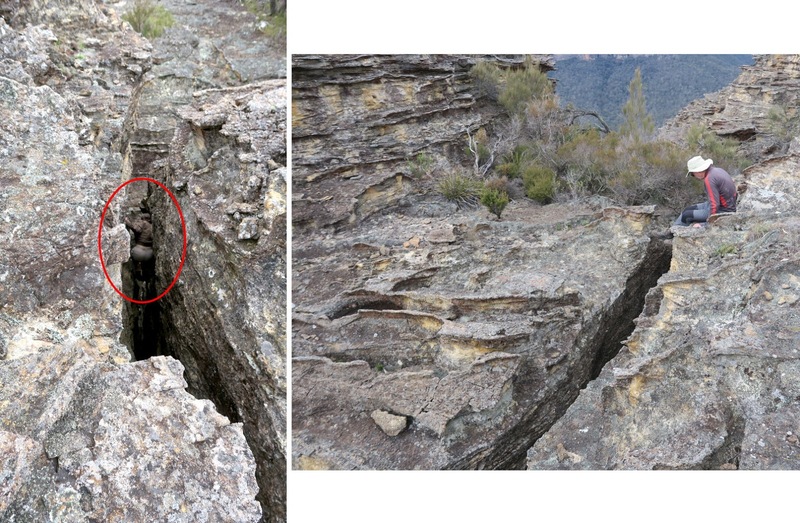 - Left pic: AOB goes down to investigate. She couldn't go very far and will climb back up soon. 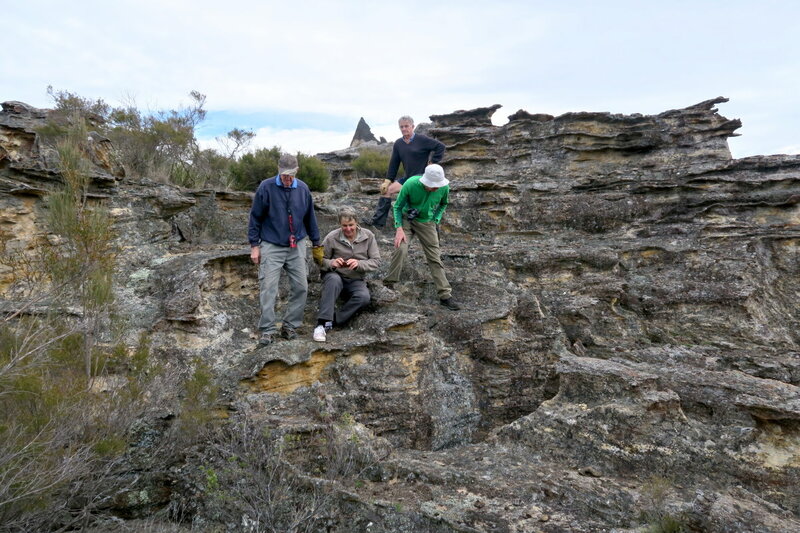 - Left to right: Geoff Fox, RS and BB are watching AOB going down the fissure. - JD is standing behind BB. - Further back, the sharp triangle is Bermuda Triangle, our destination. 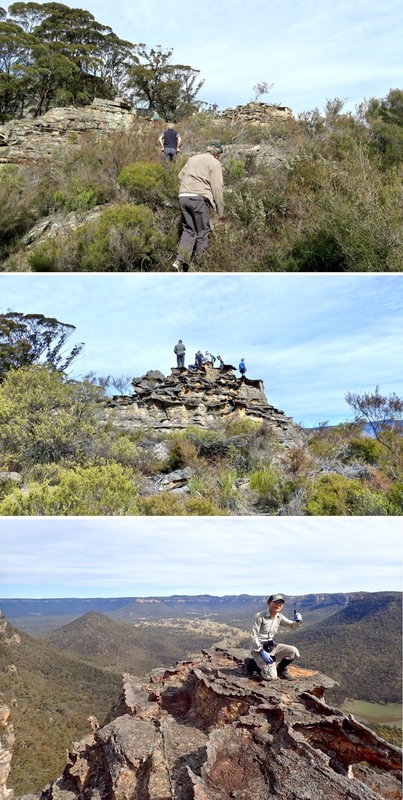 Finally, we are at Bermuda Triangle, highest point at the top of the rocks around this area. 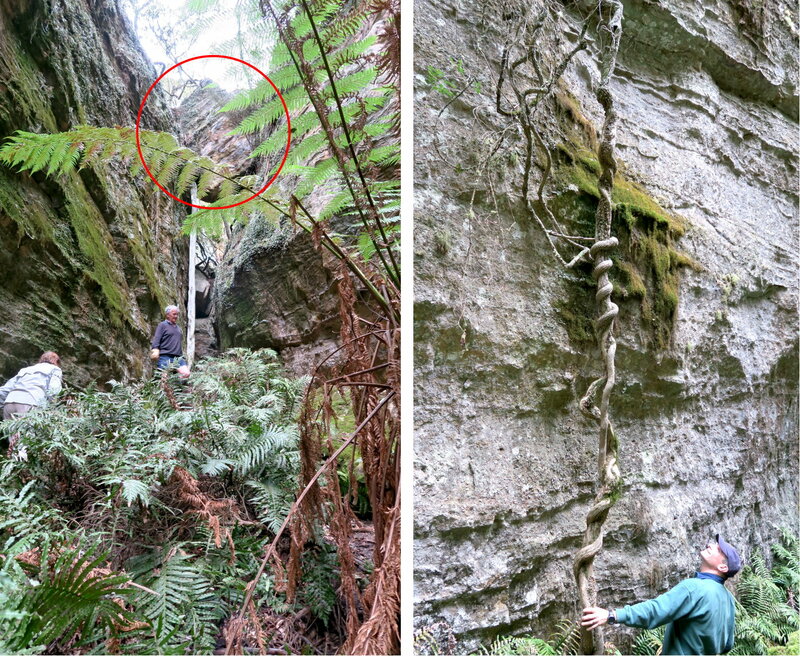 The route to here was complicated ... well, it took Geoff Fox a few years to discover it. Without him leading, it'll be very difficult for a mortal soul to find his way to here. This 180 degree view is towards east. Worth all the effort to climb up here. - Wolgan River flows along the green valley across the centre of the pic. - The bunch of buildings below and between the two red arrows is Emirates One&Only Wolgan Valley Resort. 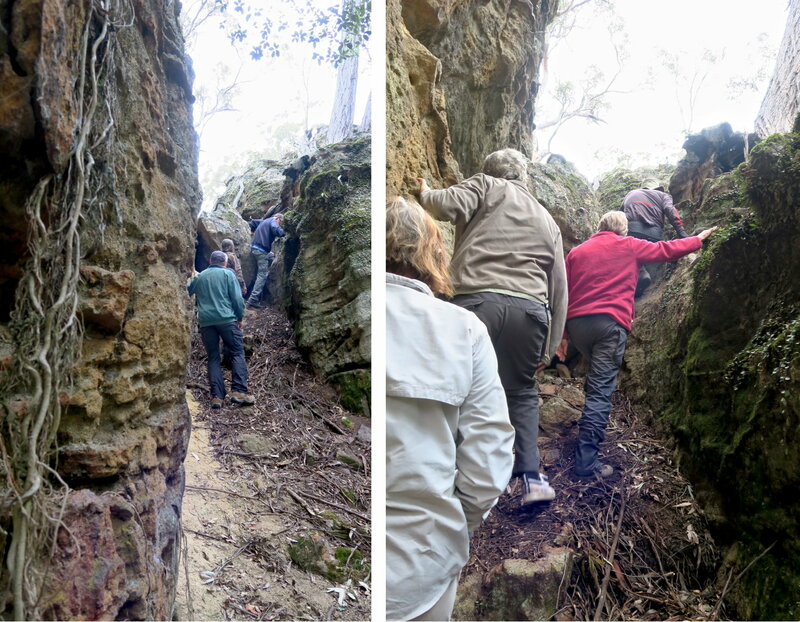 48) Retracing what we did in photo #41. 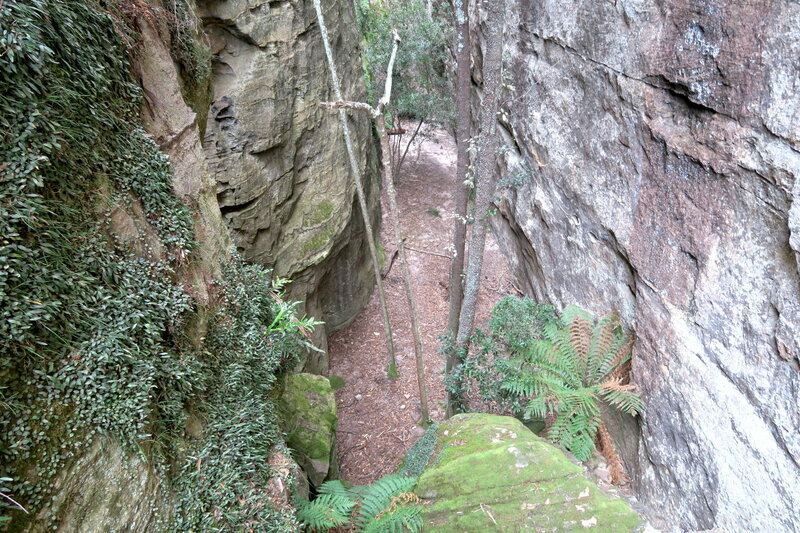 You wouldn't want to slip when you are in the previous pic ... it is a looong way down. 50) Left pic: RS retracing what we did in photo #34 ... Note the rope tied to the tree trunk. 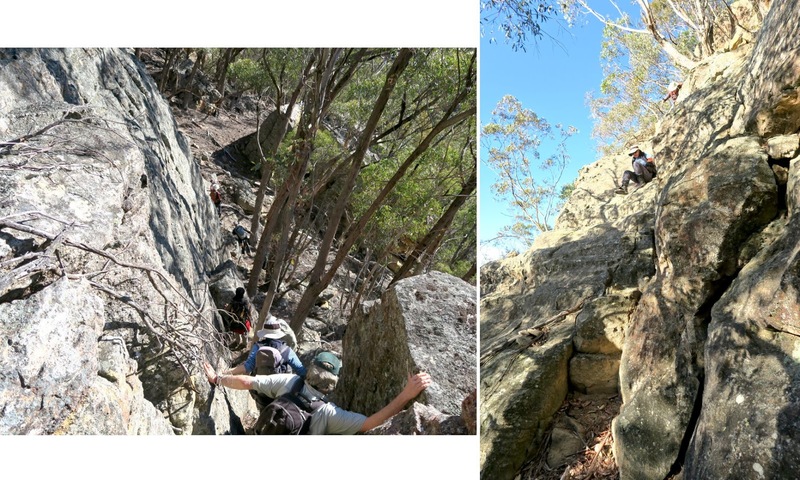 Right pic: RS retracing what we did in photo #33 ... he is using the same rope as the one in the left pic. 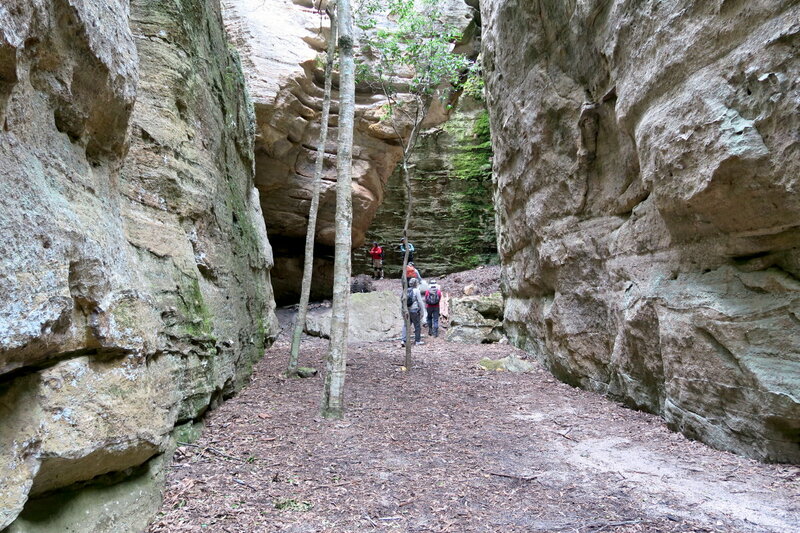 After lunch, Geoff Fox leads us to Grand Hall via High Cave. 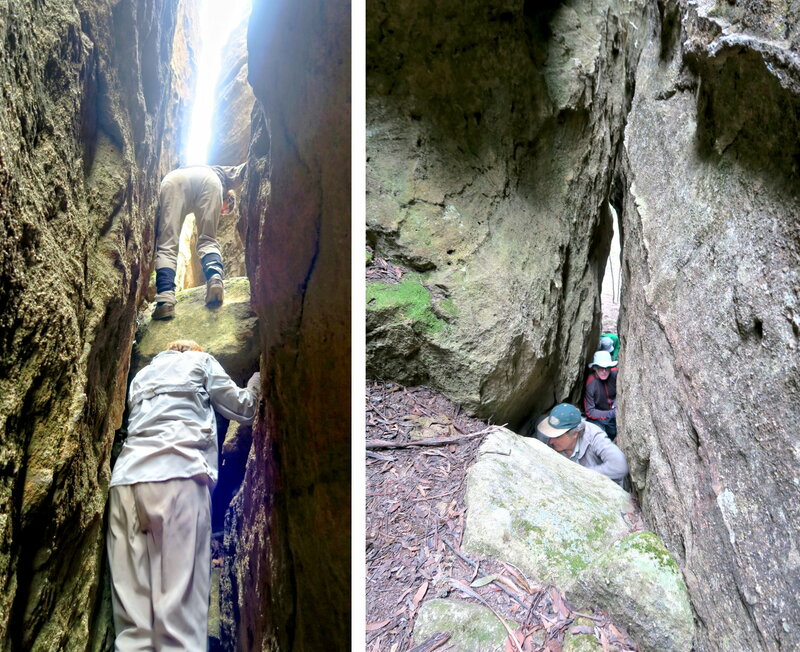 - Left pic: Geoff Fox leading us down a passage. 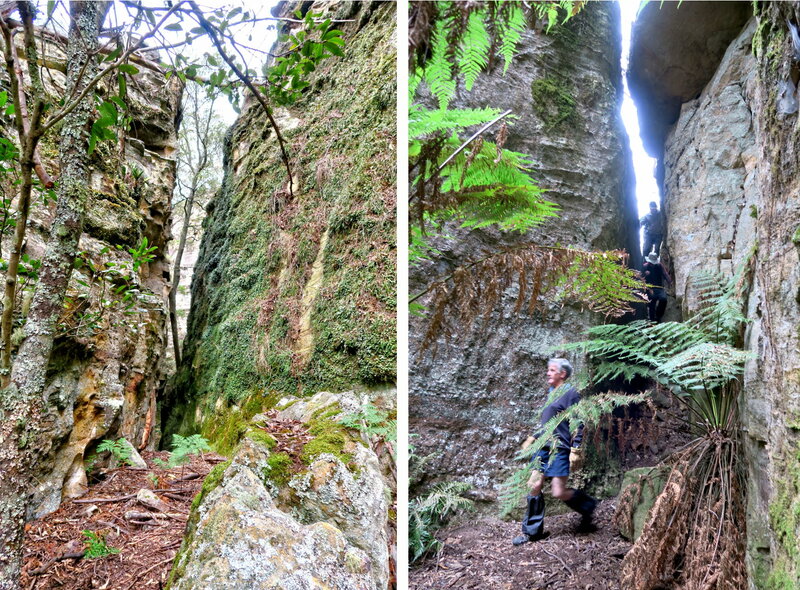 - Right pic: Closer to the end of the same passage as the left pic ... Geoff Fox is leading, followed by JP, then BL/SZ and YL. 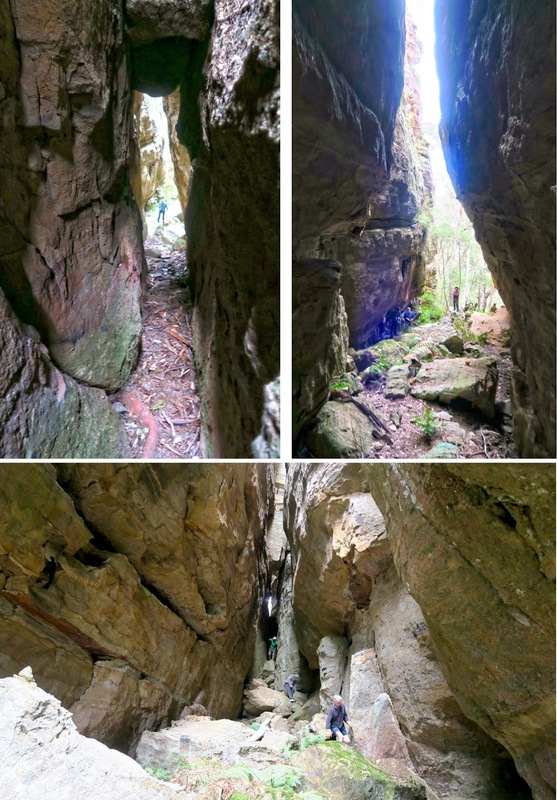 It is a cave labelled in Goeff Fox's sketch map as High Cave. 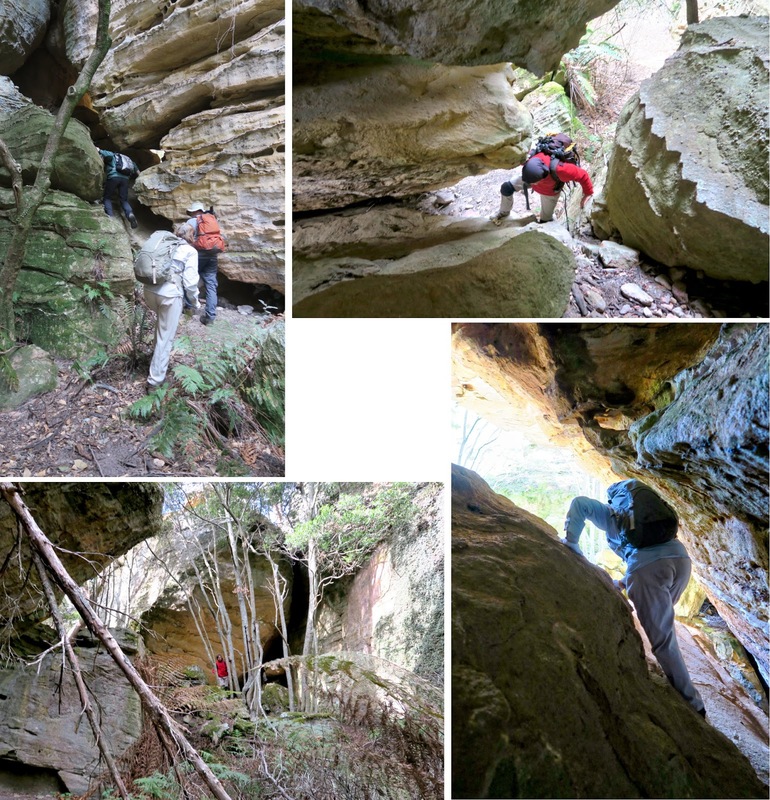 - Upper left pic: Entrance to High Cave ... BL is leading, followed by JP, then SZ. 54) There is long narrow slot leading to Grand Hall. - Upper left: SZ is directly in front. - Lower right: BL is in front of BB. 55) Left pic: Just about to enter Grand Hall. BL is directly in front; in front of him is RS; then Geoff Fox & YL. - Right pic: I am inside Grand Hall, looking back at the slot where we came from. 56) Grand Hall ... a wonderful spacious cavern with a level floor lightly covered with fallen leaves. Here, I am near the entrance and looking into the hall. As you can see from this and the next few photos, it is a beautiful chamber. 57) I've joined the guys at the back wall and looking back at Grand Hall. To my right is our next exit slot (red oval). - On the right side: BL is directly in front. • You can see a narrow vertical gap in the middle of the pic with a tree in front ... that is the narrow slot (photo #55) from which we entered into Grand Hall. - Lower pic: There is a log book in a plastic box in a recess in the wall. Geoff Fox has logged our entry and is about to put the box back into the recess. 59) We now leave Grand Hall. - Left pic: This is the narrow slot in the red oval on the right side of photo #57. 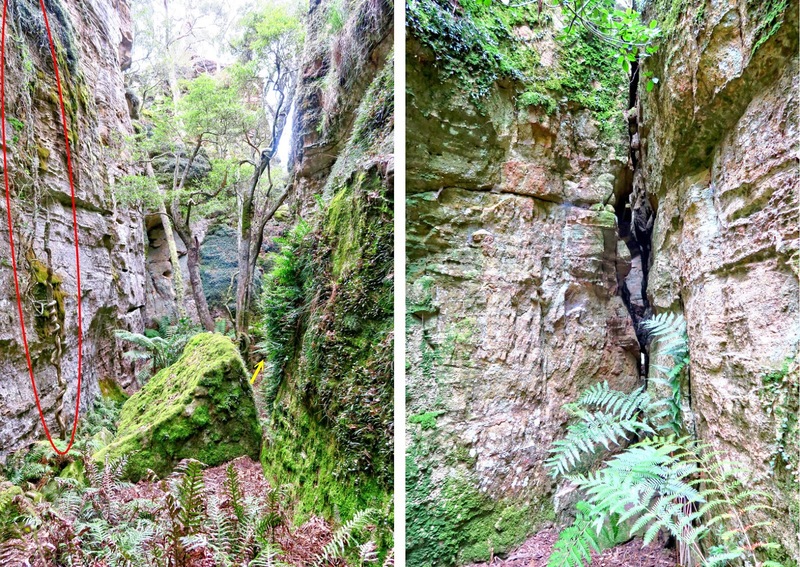 Both pics below are of the same passage. In particular this pic is taken at the same spot as the right most pic of photo #44 in the above link. 62) We are in the north branch on the western side of Donkey Canyon ... in the sketch map at the top left hand corner, we are walking from right to left (westward) in the passage represented by the 3 red dots. 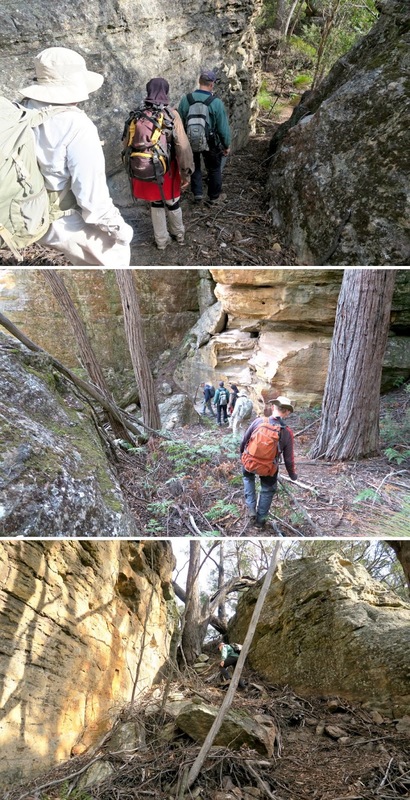 - Upper right pic, middle red dot: Inside the passage ... JP is directly in front. In front of him is SZ, then BL and JD. This pic is the same as photo #45 of the above link. - Lower right pic, left red dot: JP on left and RS on right exiting out of the north branch. This one is the same as photo #46 of the above link. After we exit out of the north branch (previous pic), we are then in Titanic Canyon. 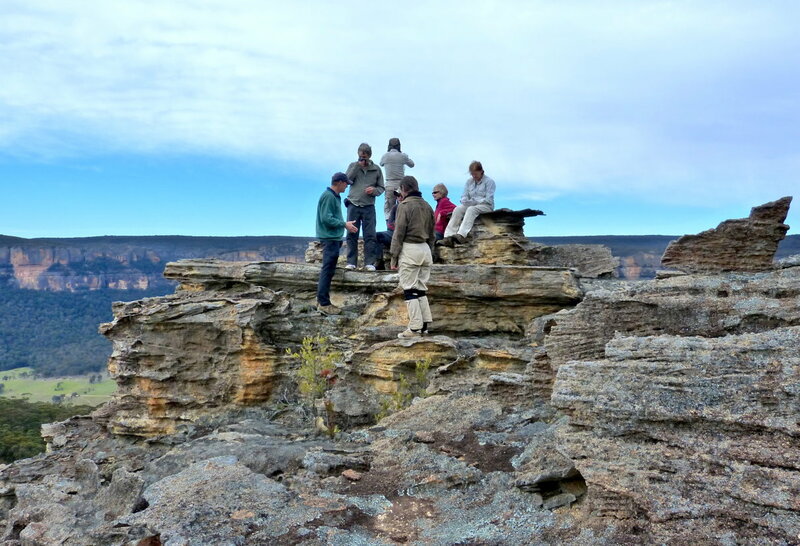 What we want to do now is to go south a bit, then south-west to Secret Canyon. 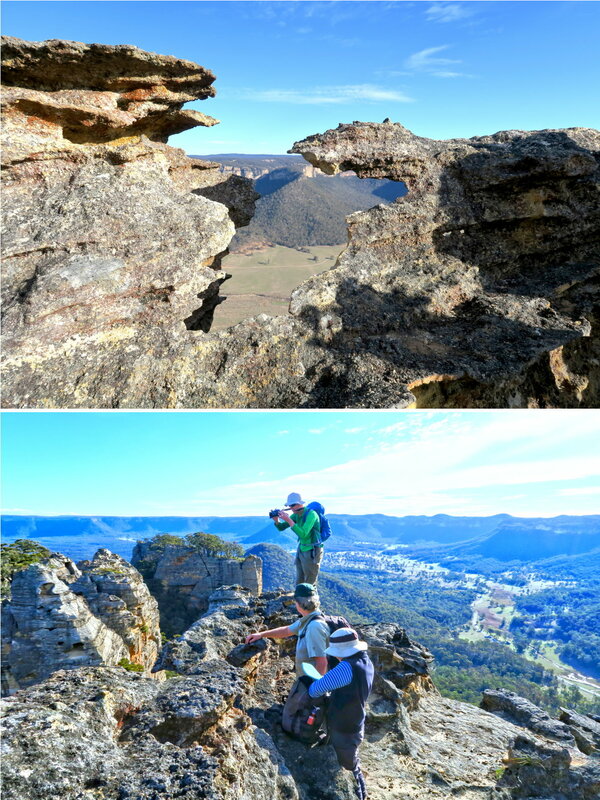 But first, we make a detour to Wolgan Window. 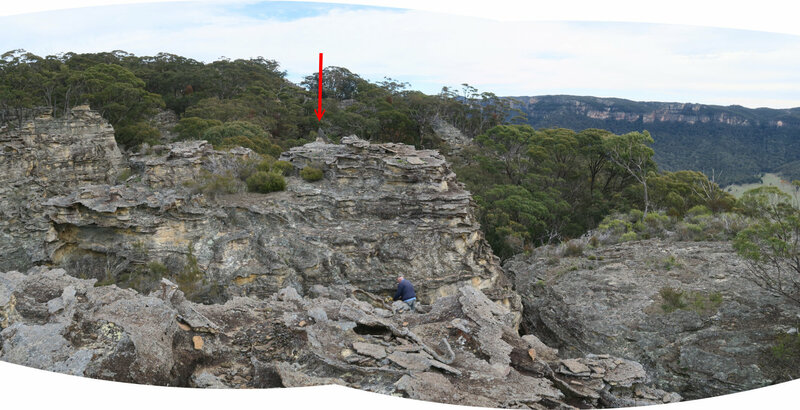 Wolgan Window (labelled as such in Geoff Fox's sketch map) is at the end of a narrow slot which has a good view to a conical-shaped hill west of Donkey Mountain. 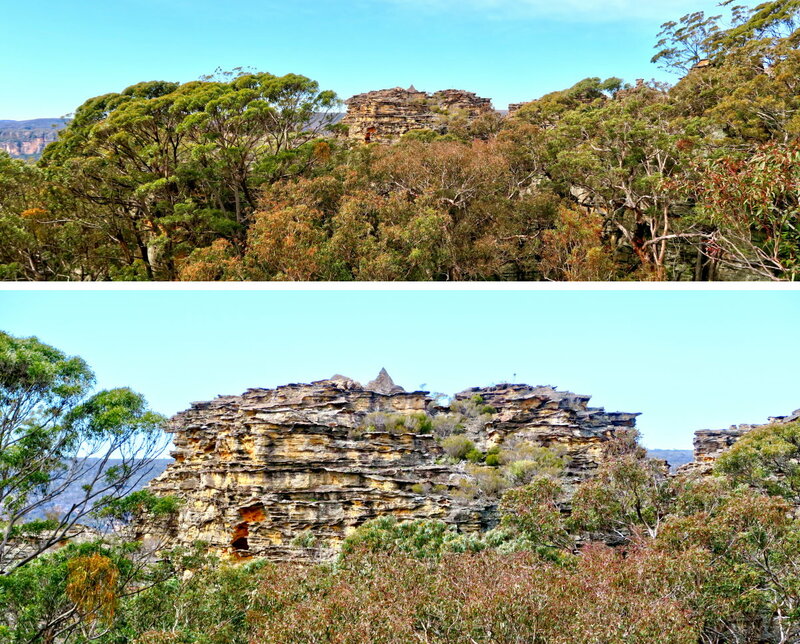 The story goes that the hill is actually Mt Wolgan. However, the cartographer placed the label "Mt Molgan" wrongly at the west end of Donkey Mountain, hence the hill is now unnamed ... haha ! - Left pic: Towards the end of the slot. RS is directly in front, then BL and JD. 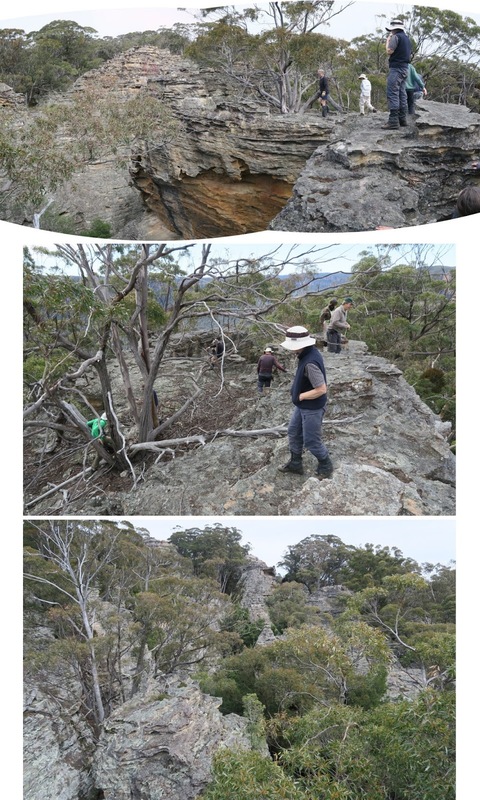 - Middle pic: View from the end of the slot, towards the unnamed hill ... This is as far as we can go in the slot. - Right pic: Backtracking out of the slot ... JP is directly in front. In front of him is AOB. 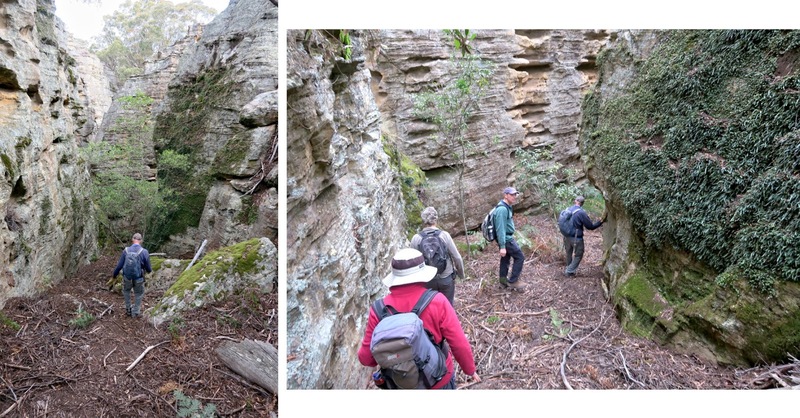 After Wolgan Windrow, we head towards Secret Canyon. 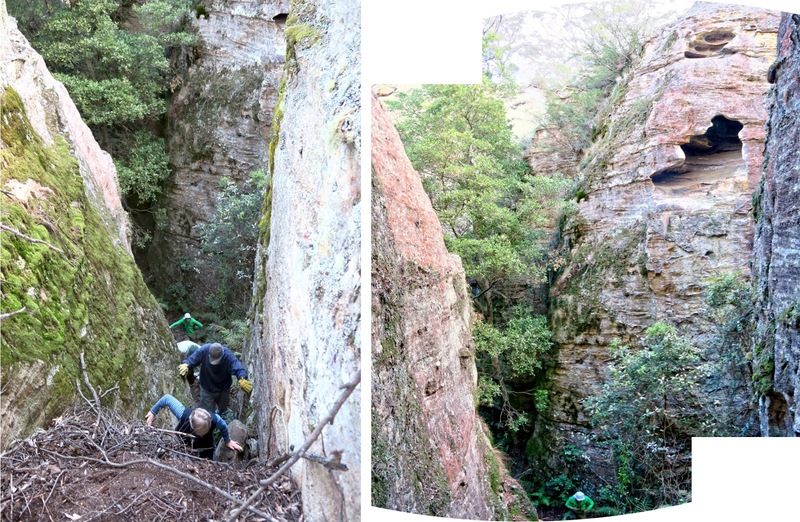 - Left pic: We pass the mouth of south branch on the western side of Donkey Canyon. In the sketch map at the bottom of the pic, I'm at upper red dot looking towards north-east. The end of this passage is photo #62. In this trip we do not enter this passage. Instead we keep going south ... to the right pic. - Right pic: At the lower red dot in the sketch map, looking towards south-west. AOB is in front of me. In front of her is YL and BL. 66) Traverse across this steep slope. - Upper pic: JP is directly in front. Further away is AOB. 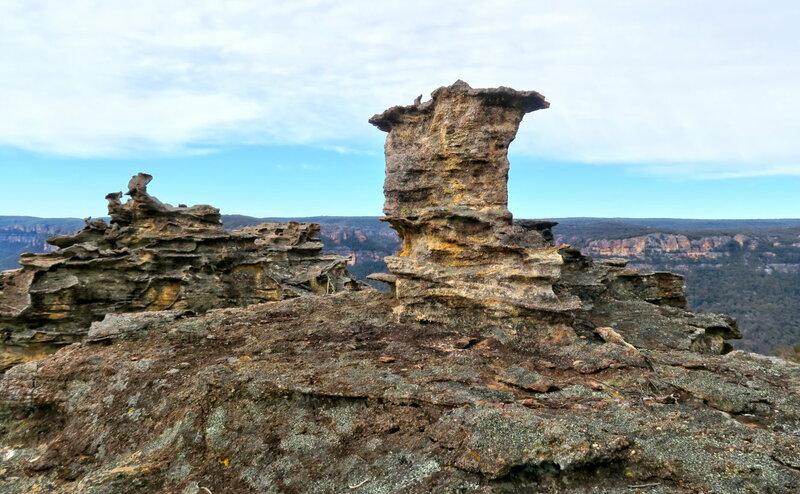 67) Just before we enter Secret Canyon, we have a nice view of Donkey Mountain's highest peak, the vertical rock column in the centre of the photo. Unfortunately it is not climbable without climbing gears. 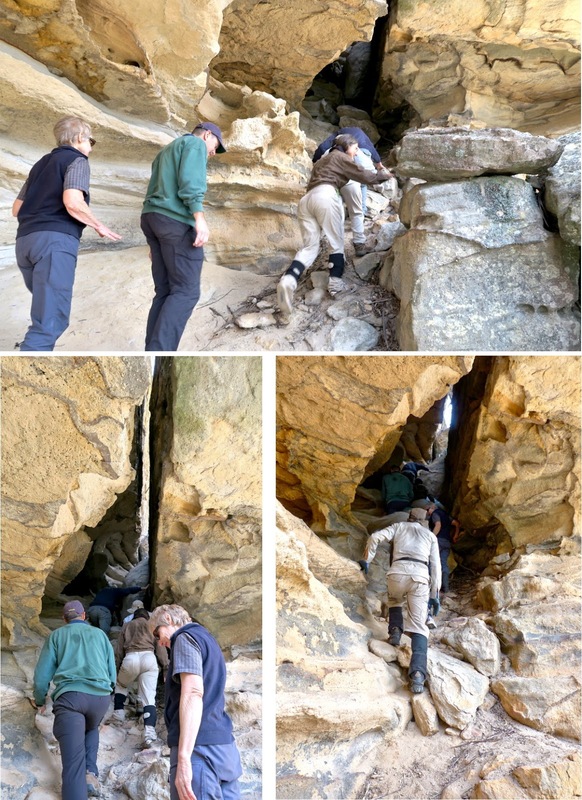 - Lower right: This is the end of the slot after which it is a steep drop. AOB made a half-hearted attempt to go down. But she didn't go far. In the pic, SZ has turned around and is now heading back. • BB is at the bottom. - Upper pic: Geoff Fox is directly in front. SZ is sitting on top of the lookout. - Lower pic: Geoff Fox is directly in front. In front of him is YL. SZ is sitting and enjoying the view. 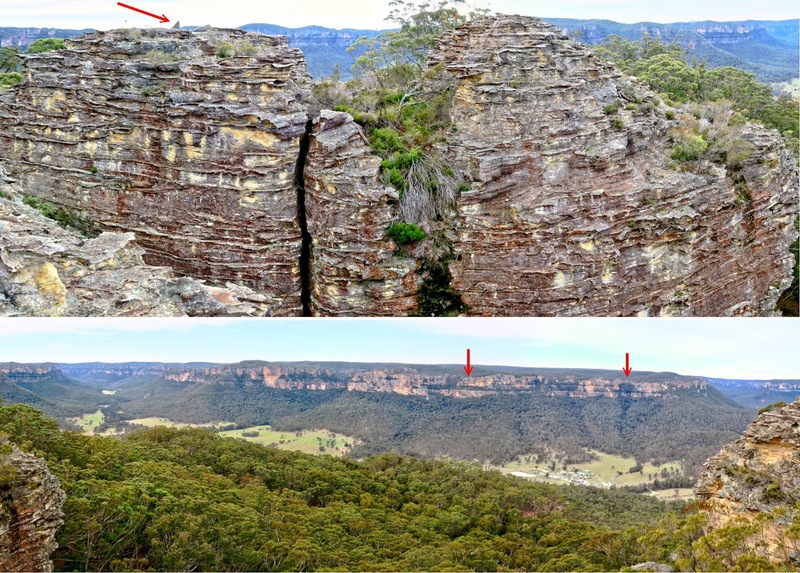 - Upper pic: This panorama is towards south-east at Wollemi National Park, similar to the right half of photo #47. 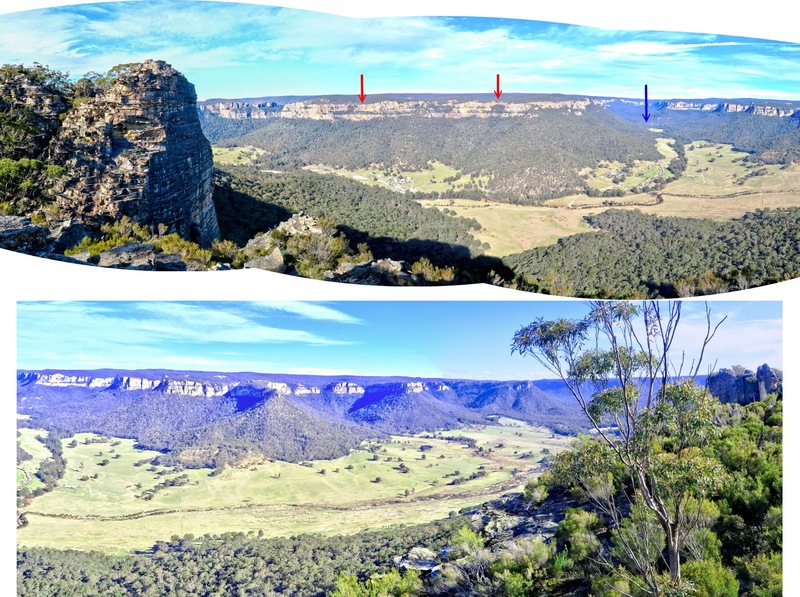 • Wolgan River flows along the open green valley across the centre of the pic. • The bunch of buildings below the left red arrows is Emirates One&Only Wolgan Valley Resort. • Blue arrow: Carne Creek flows in the valley there. The red arrow points to the highest peak in Donkey Mountain. Unfortunately it is not climbable without climbing gears. 75) This is the end of our Donkey Mountain exploration. 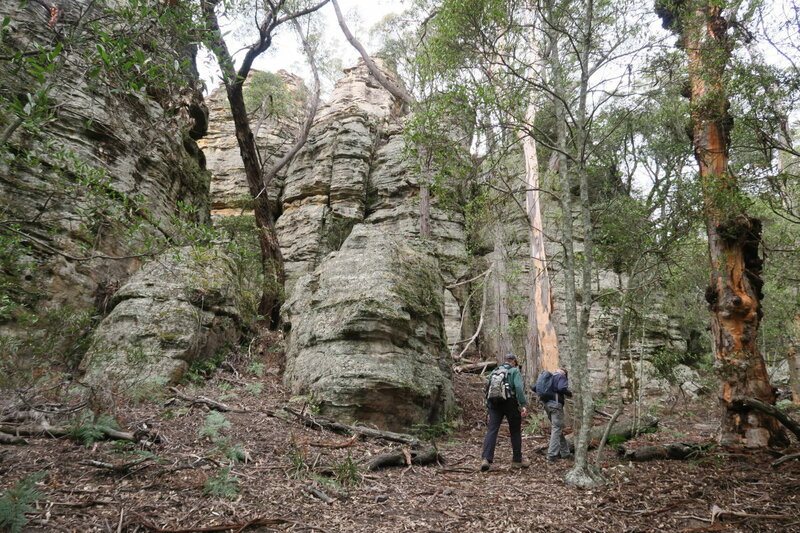 Instead of retracing our steps, we walk towards the west end of the mountain and will climb down from there. 76) We come to a lookout with a 180-degree panoramic view. 77) View from the above lookout ... it is similar to photo #11. - Small red dot: Carpark by the side of Wogan Road ... where our cars are parked. 78) We keep going towards the west end of Donkey Mountain. 79) At another lookout ... this one is even better ... with a 270-degree panoramic view ... see photo #80. - Lower pic: BB is taking photos. In the middle is RS. YL is directly in front. - Upper pic: This panorama is toward south-east and is similar to photo #72. 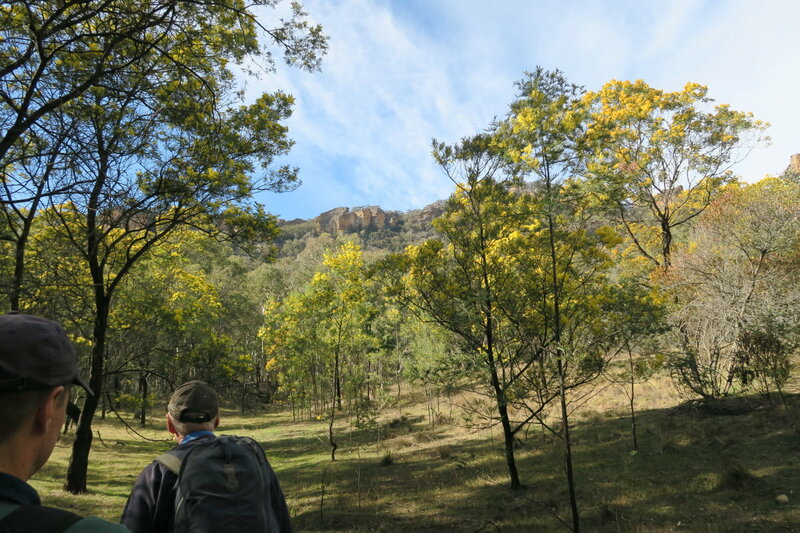 • Left side of Carne Creek is Wollemi National Park. 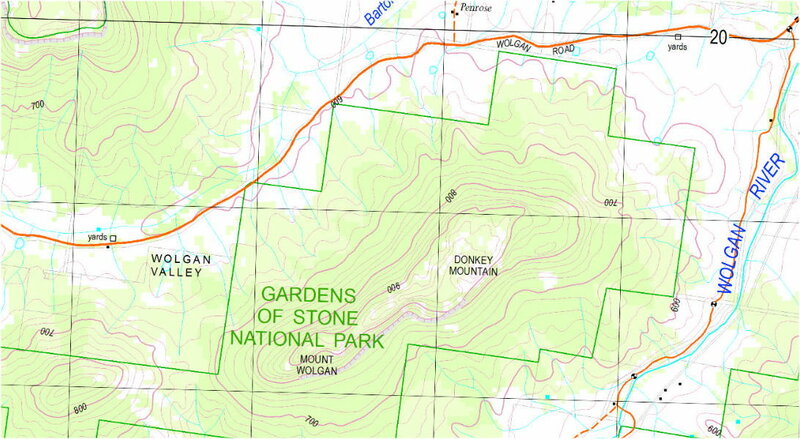 • Right side of Carne Creek is Gardens of Stone National Park. - Continuation to the right of the lower pic is photo #77 and won't be repeated here. Donkey Mountain deserves several more visits. One day, I would like to come up here again and explore more.